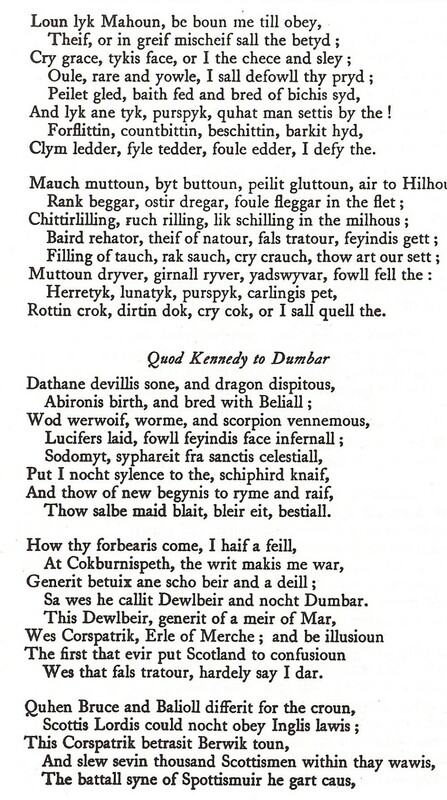 Some commentators may argue that Dunbar was a son of the Gareltons' others suggest that, as it was quite likely he was the grandson of Sir Patrick Dunbar of Biel (l) he was probably born nearer to the place of his name. 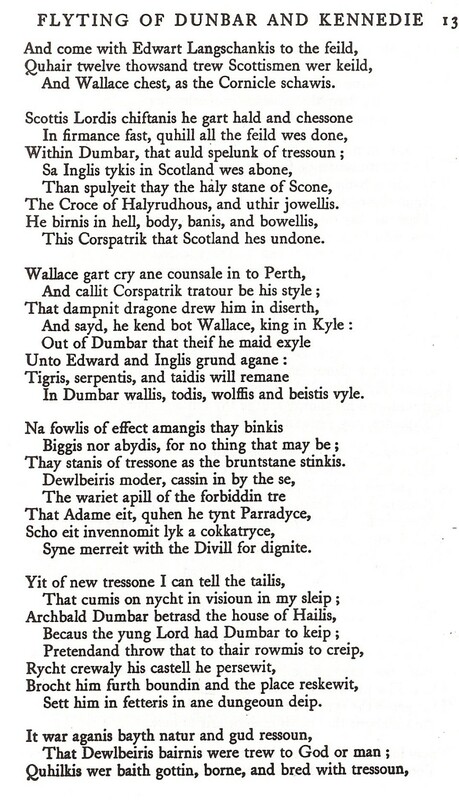 William Dunbar entered St Andrew’s university whilst aged around 10 in 1475 to take his MA. 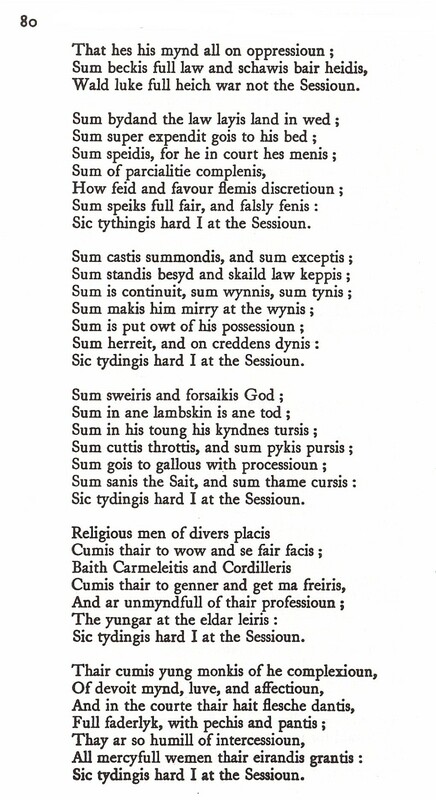 In those days this level of education was roughly equivalent to that of secondary schools today. 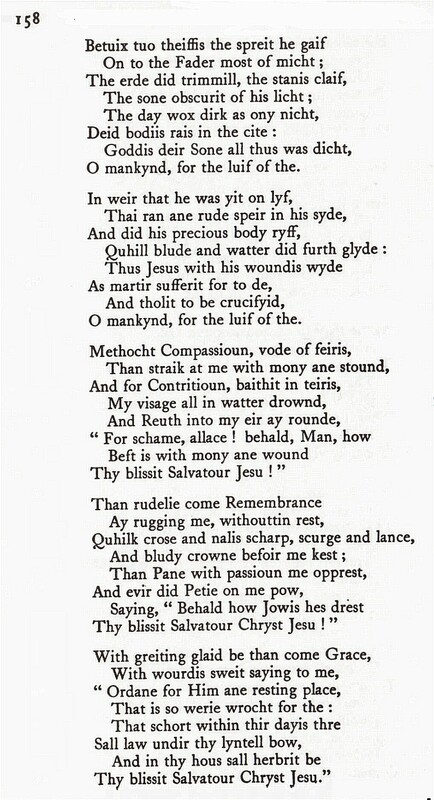 Thereafter he became a Franciscan novice and visited every flourishing town from Berwick down to the Kent coast and in the process preached at Dernton and Canterbury. 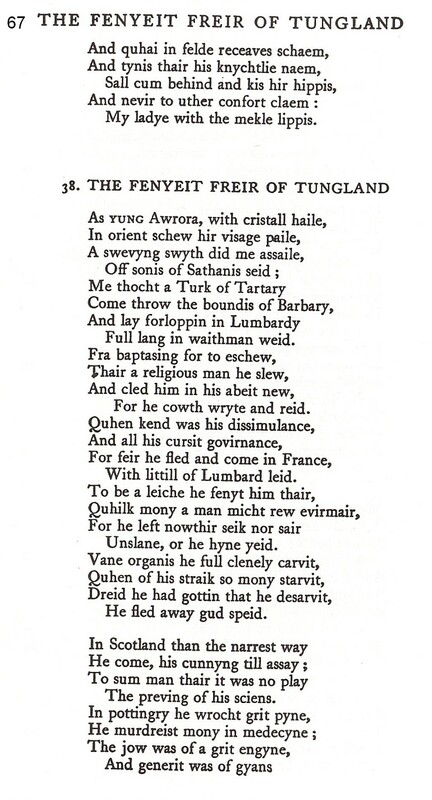 He crossed from Dover to the then Picardy, to instruct, where possible, its denizens. 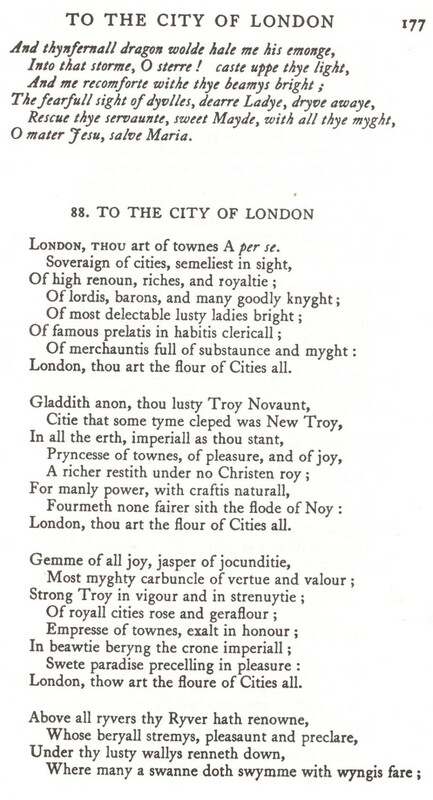 He also ventured a good deal further West. 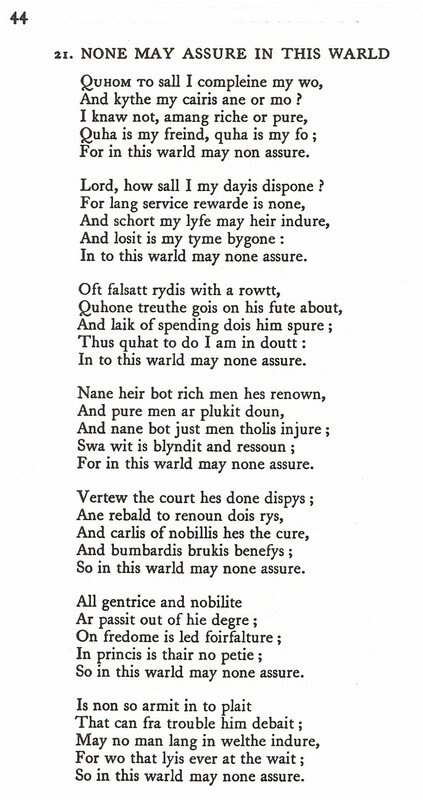 He became an ambassadorial secretary for James IV carrying out diplomatic missions. 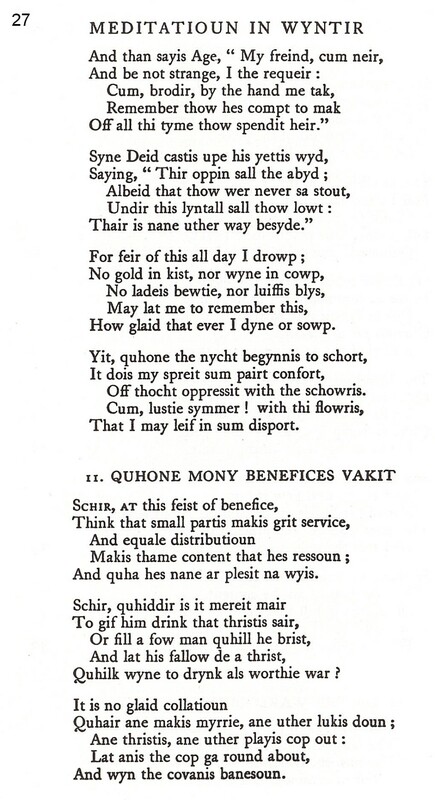 At the turn of the sixteenth century he earned £10 as a salaried court poet which rose to £80 by 1510. 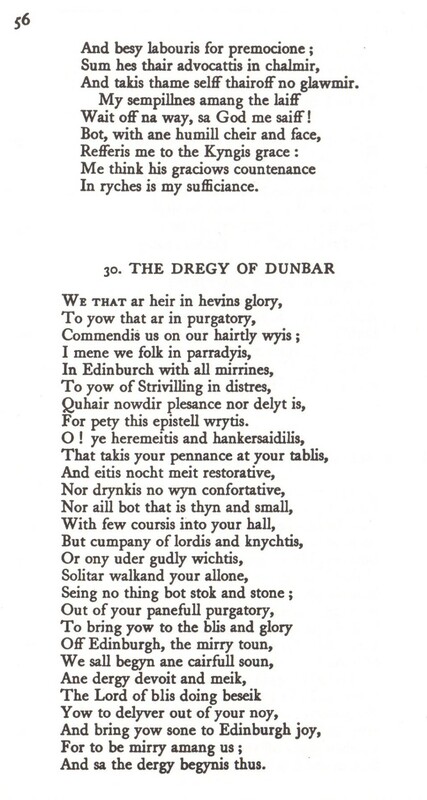 Dunbar also made marital arrangements for James IV with his English wife-to-be. 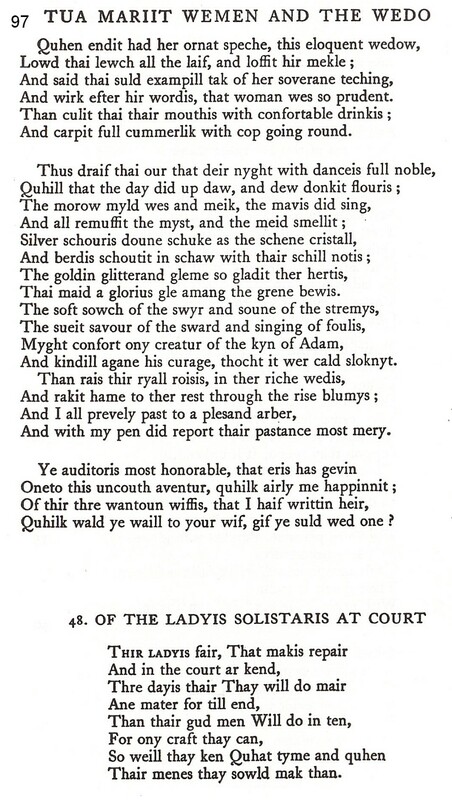 In 1503 he penned the sparkling political allegory “The Thrissil and the Rois (The English rose Margaret and the thistle James). 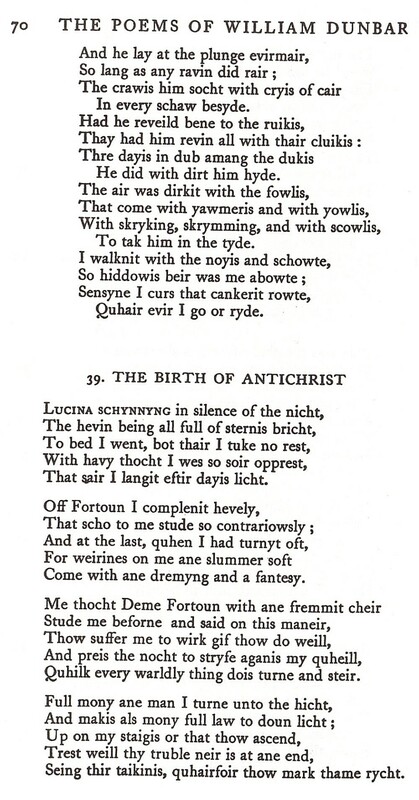 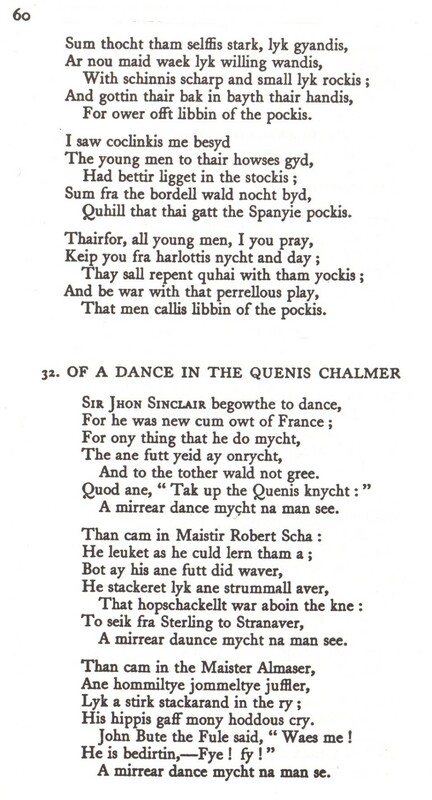 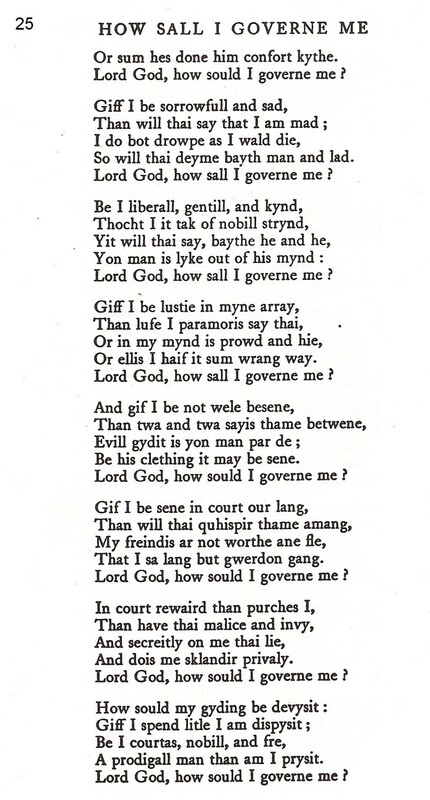 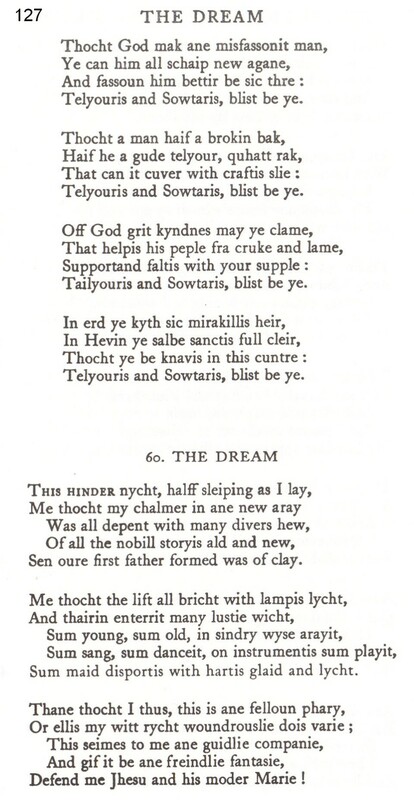 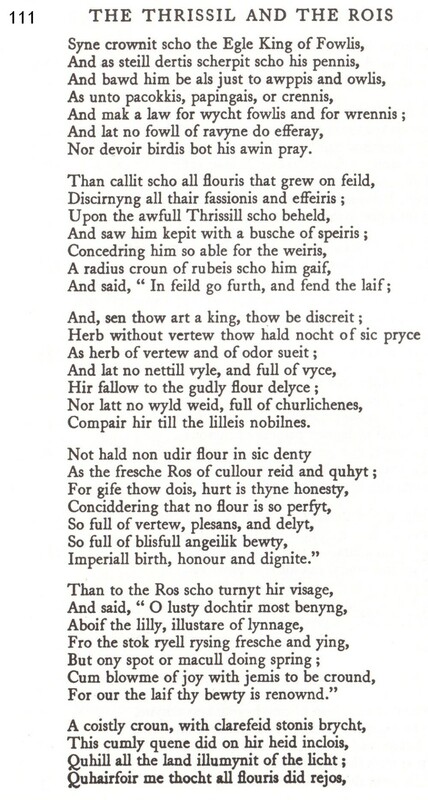 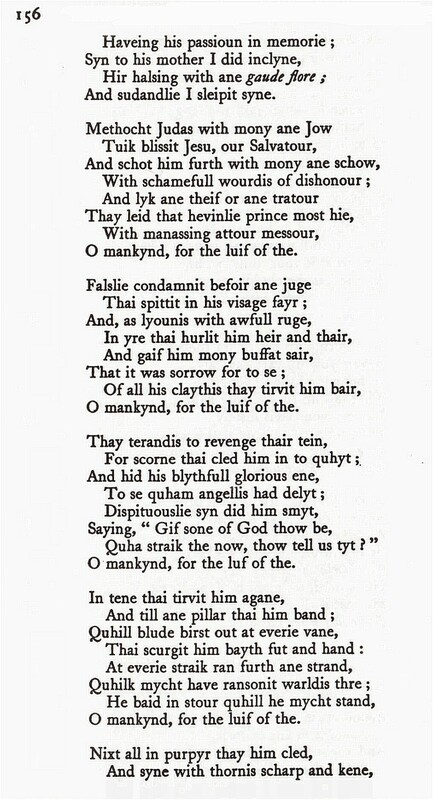 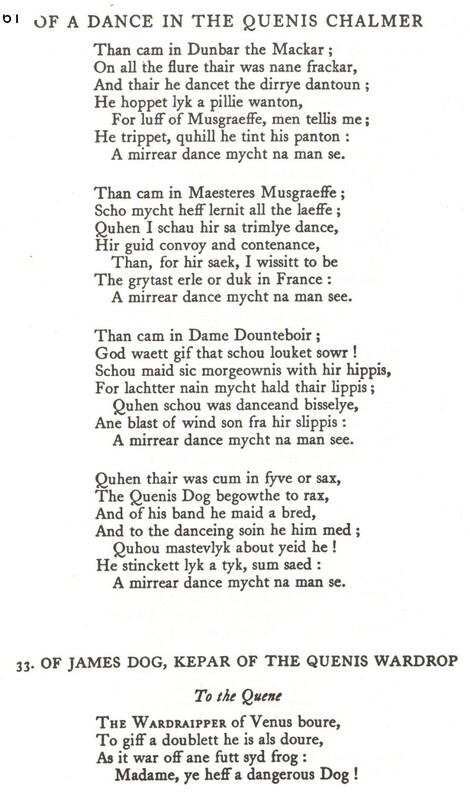 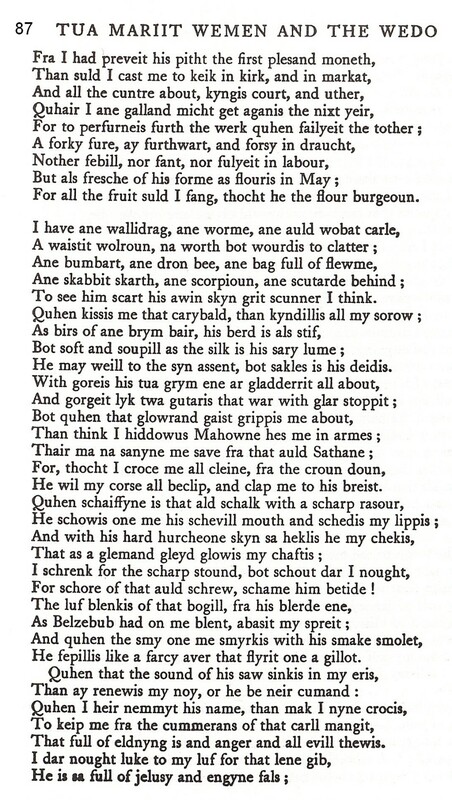 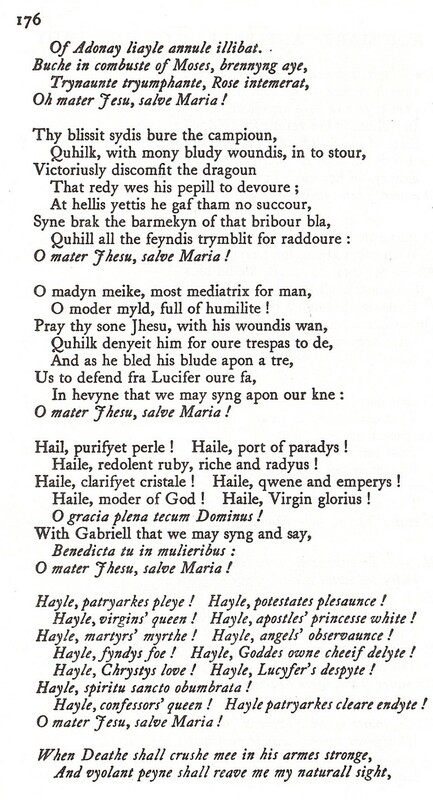 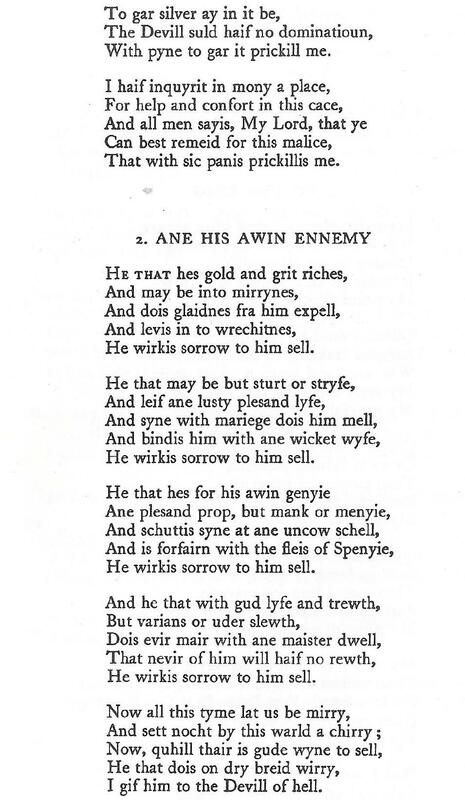 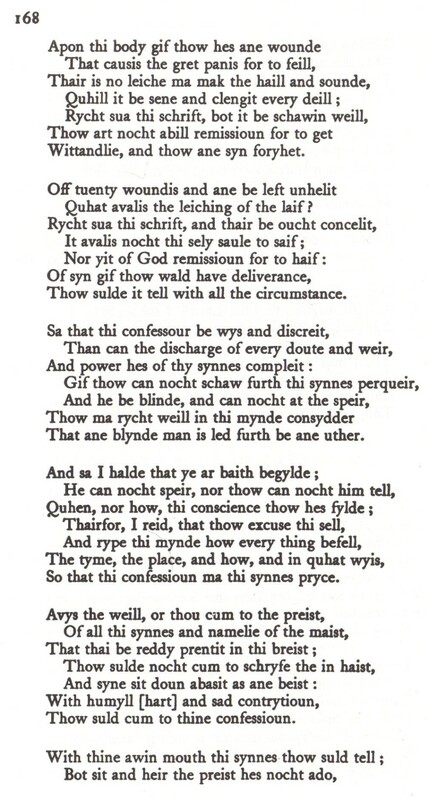 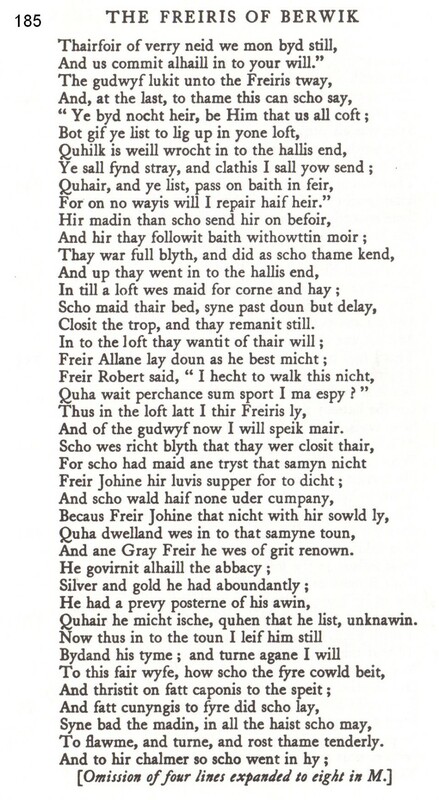 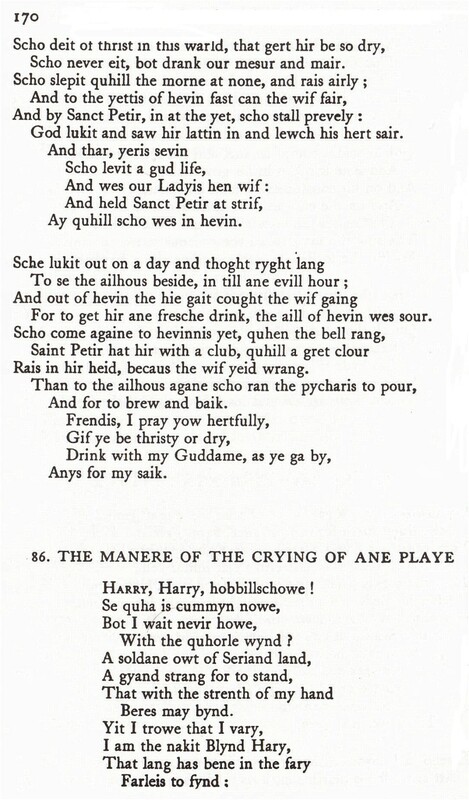 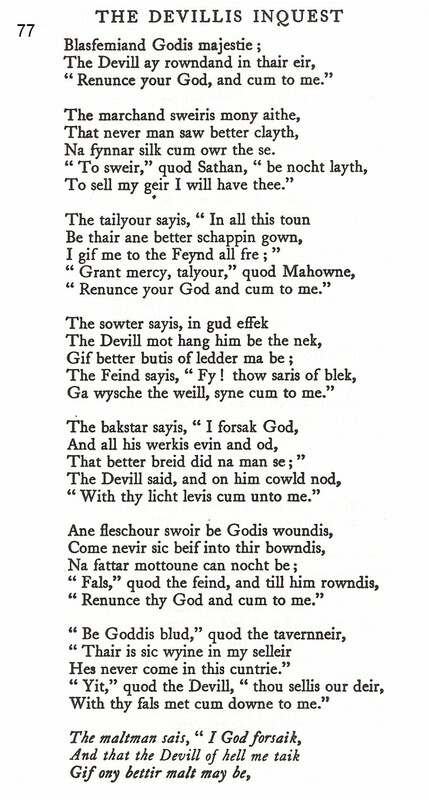 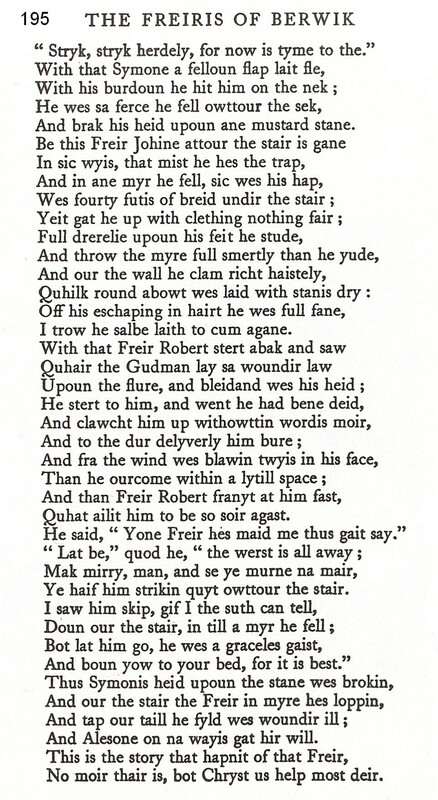 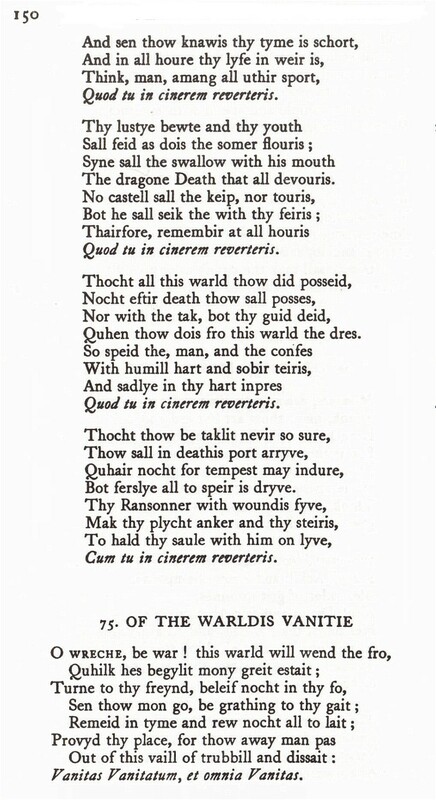 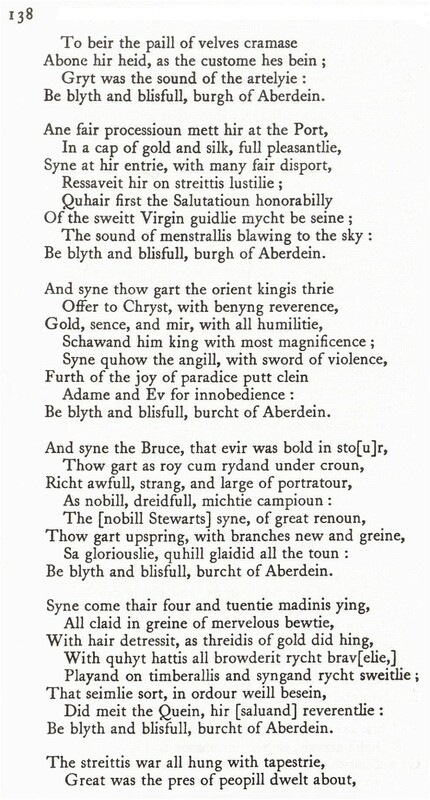 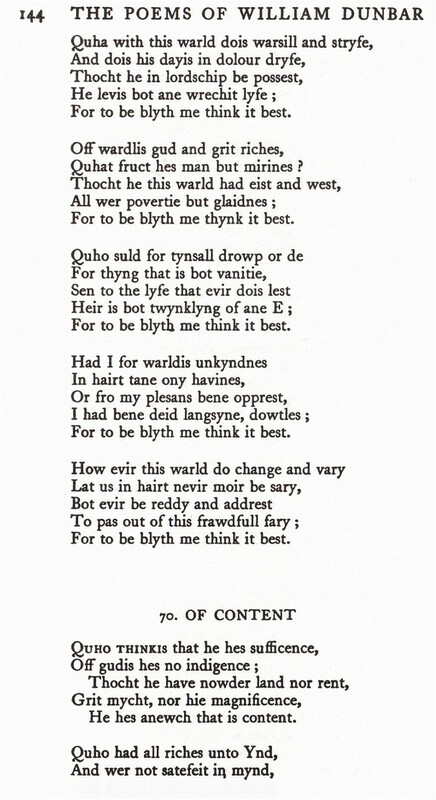 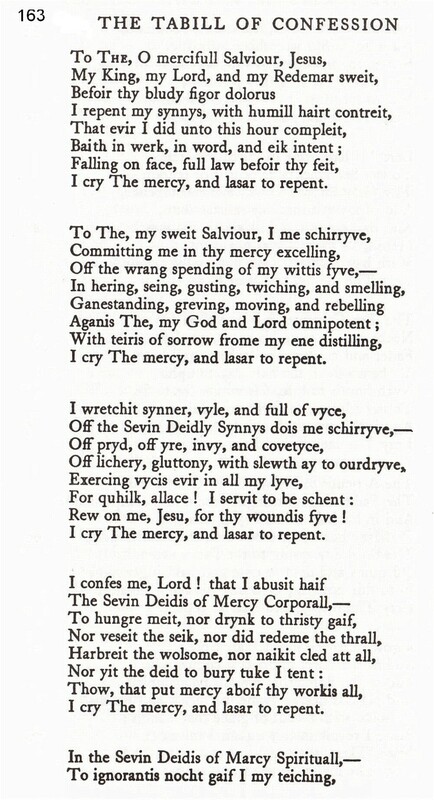 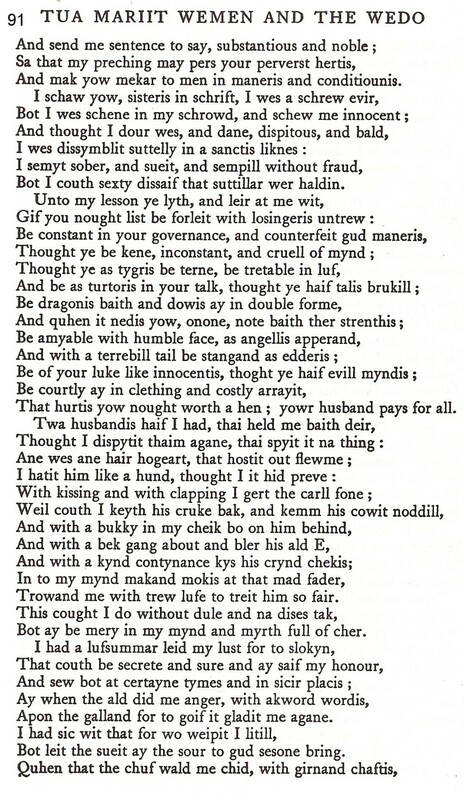 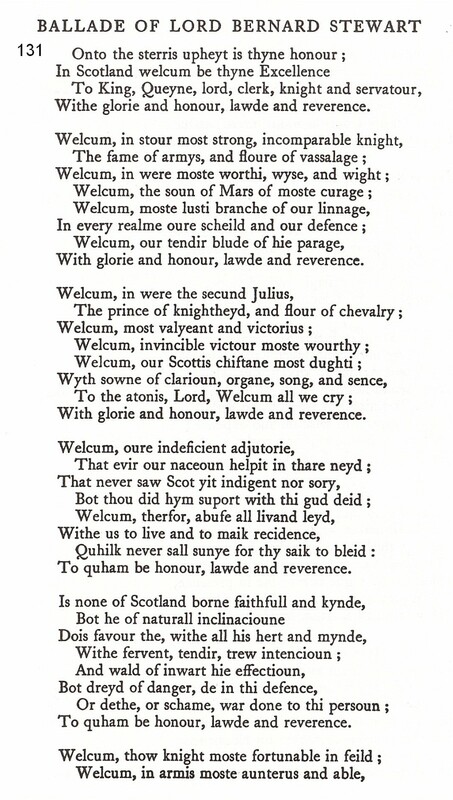 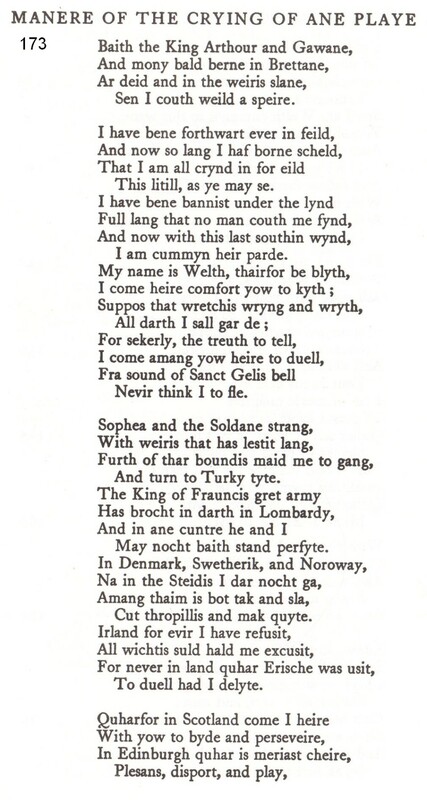 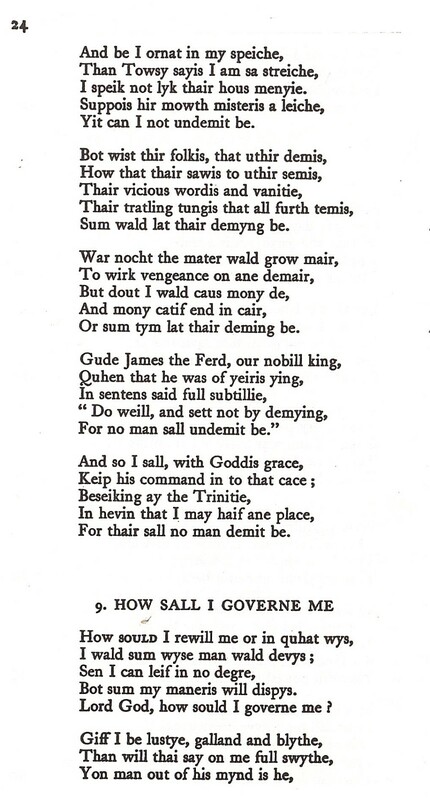 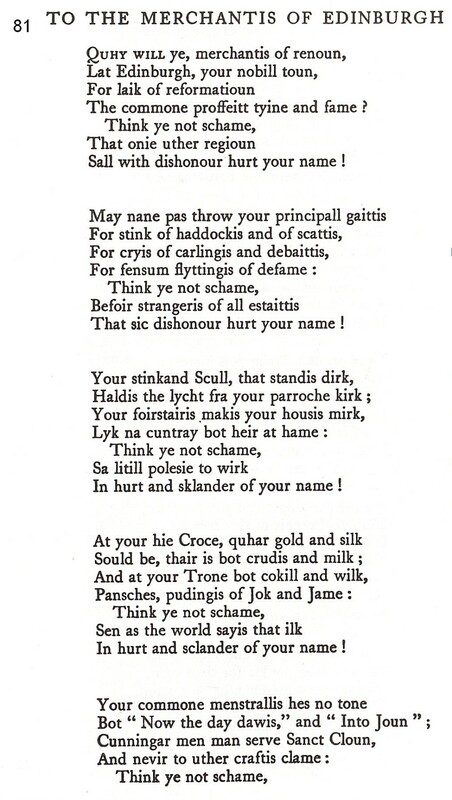 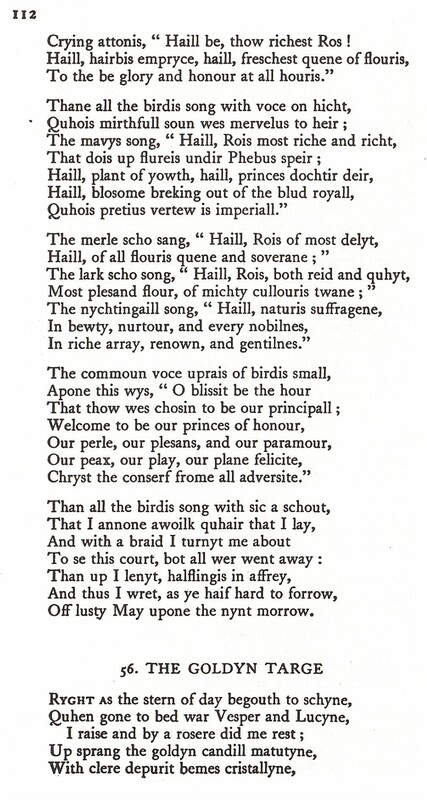 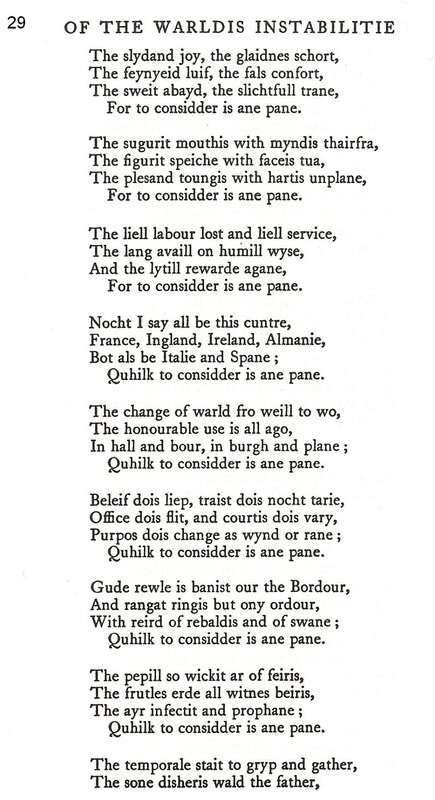 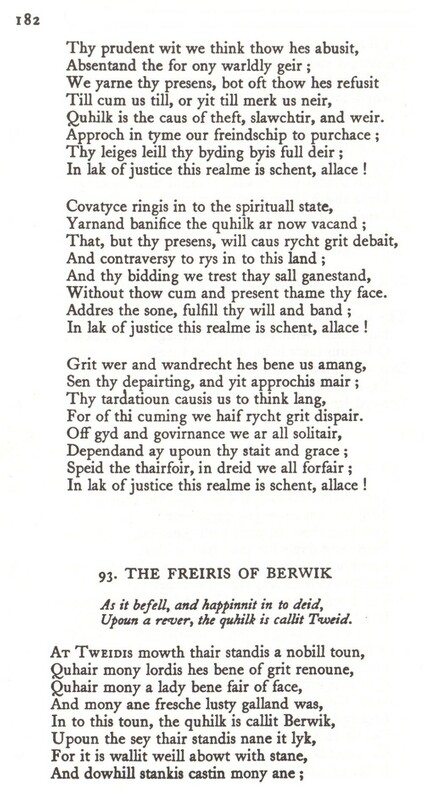 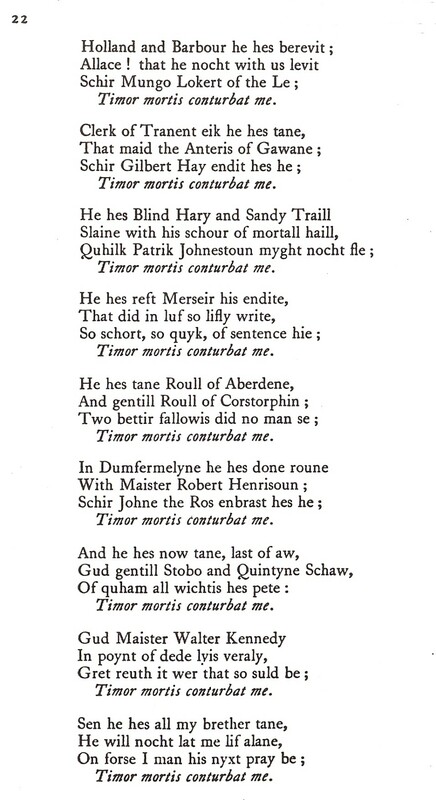 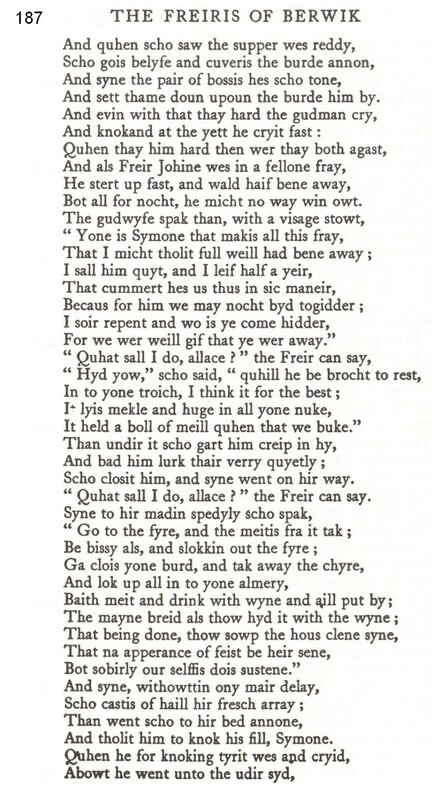 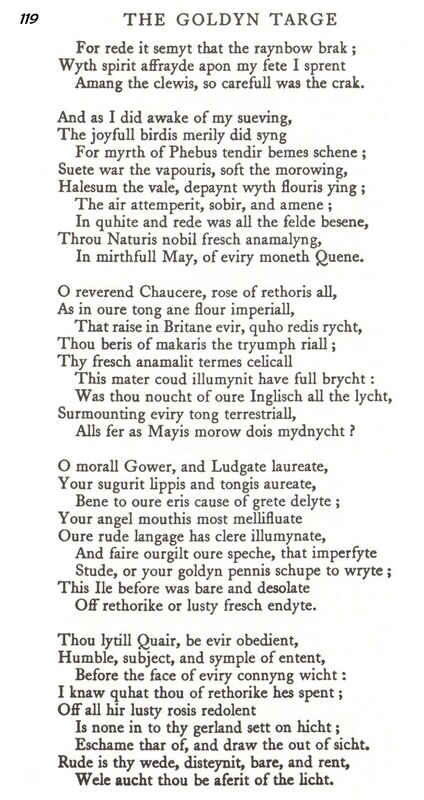 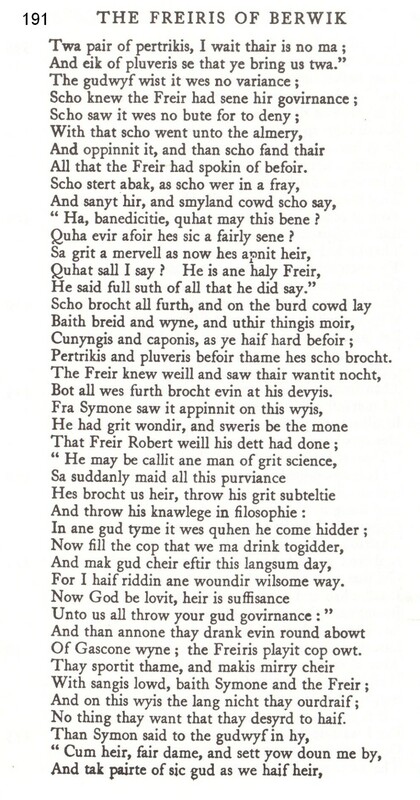 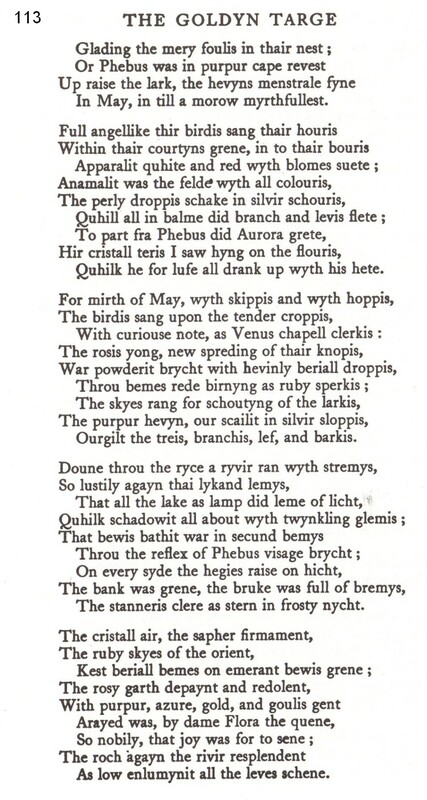 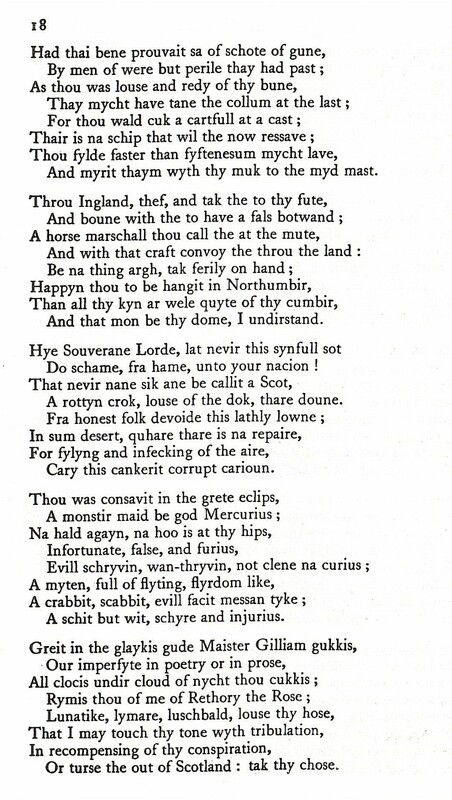 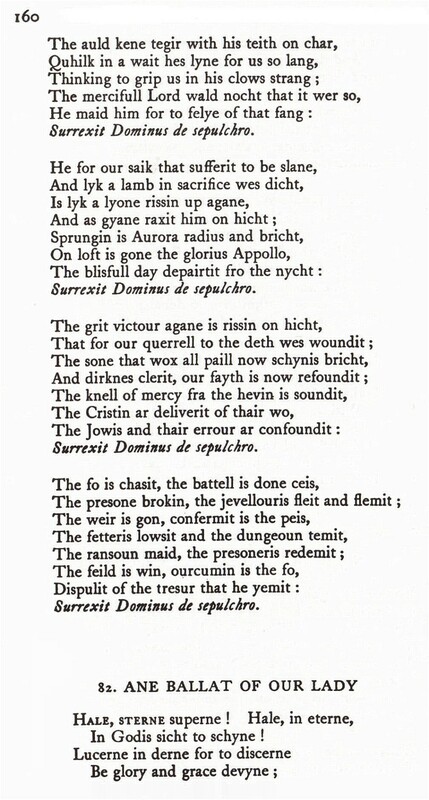 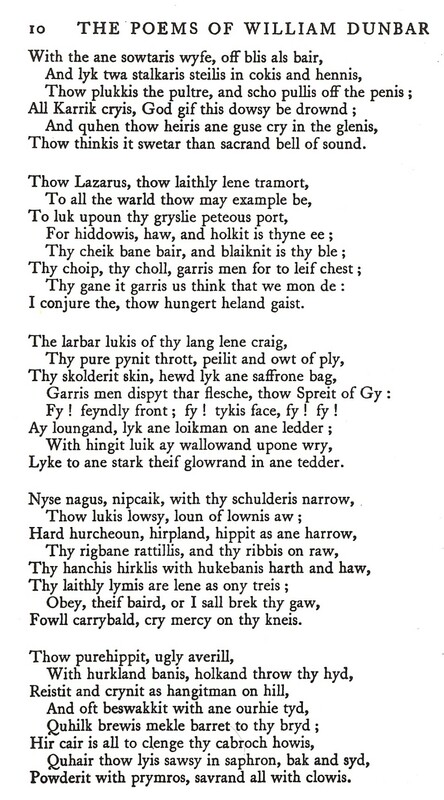 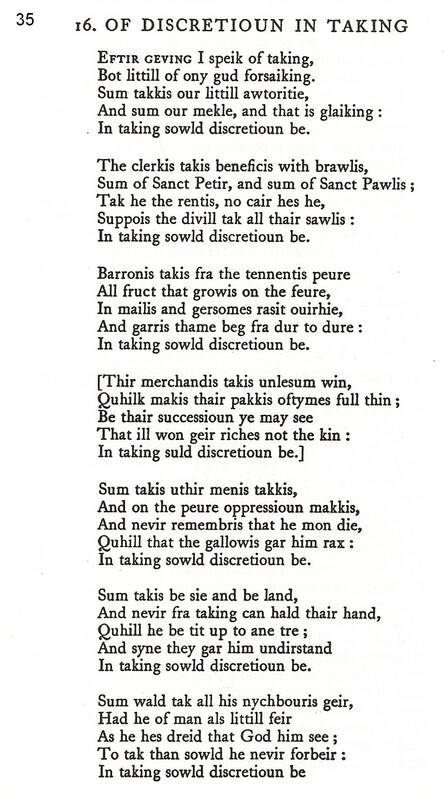 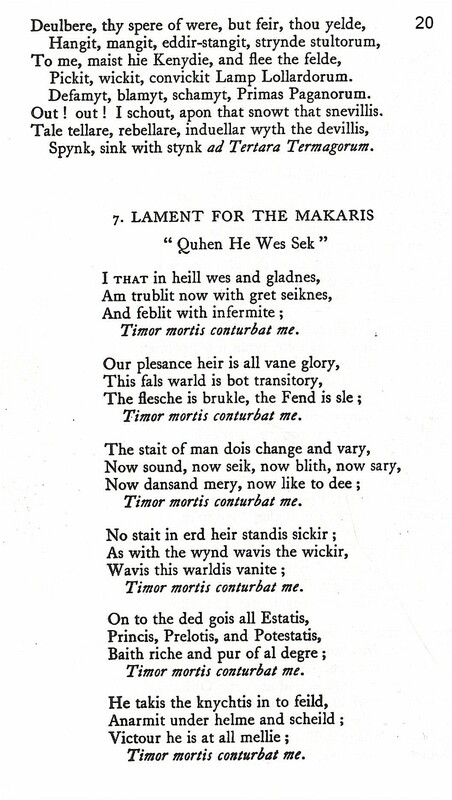 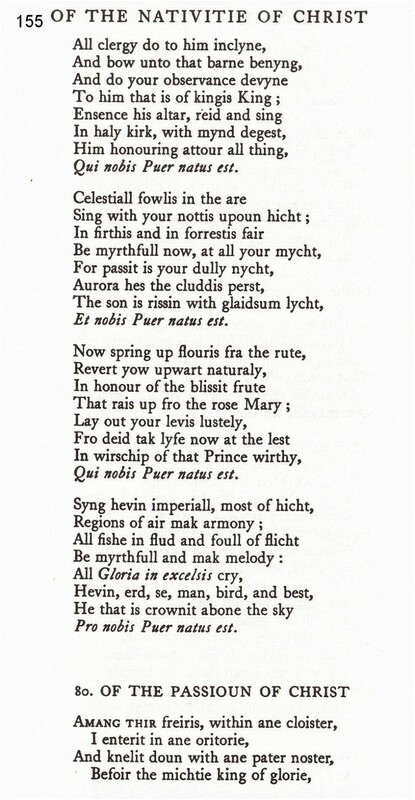 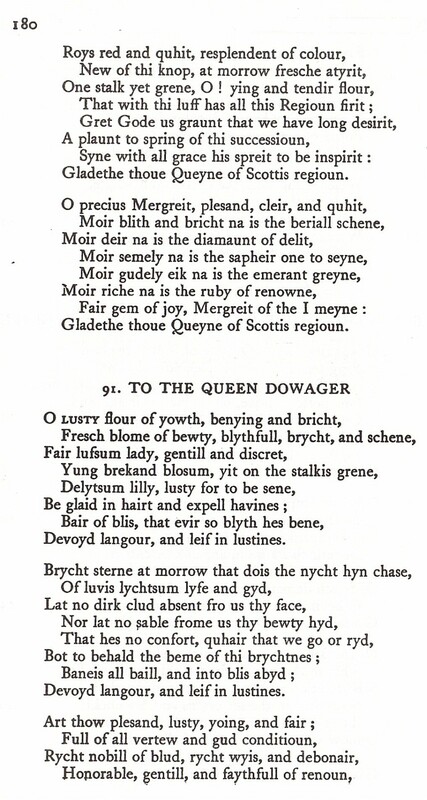 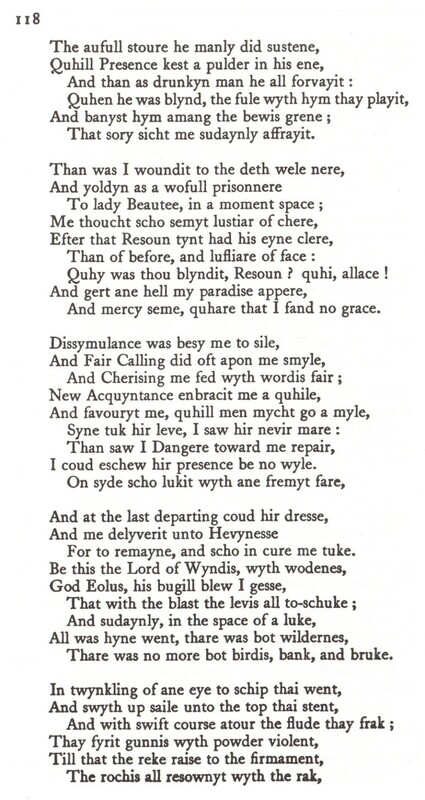 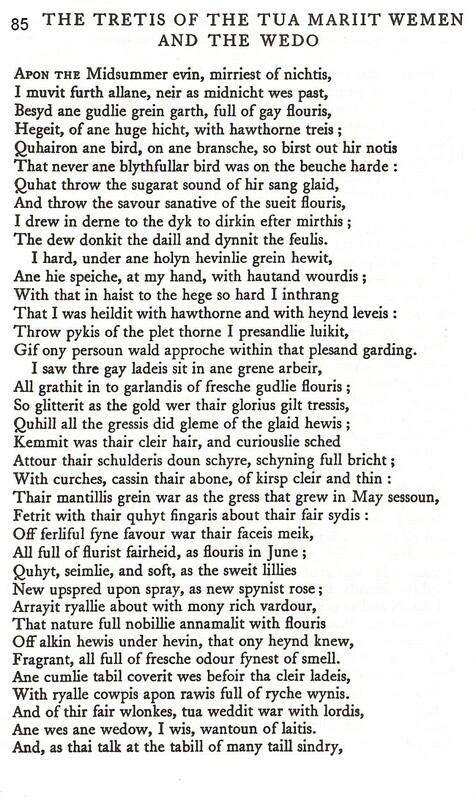 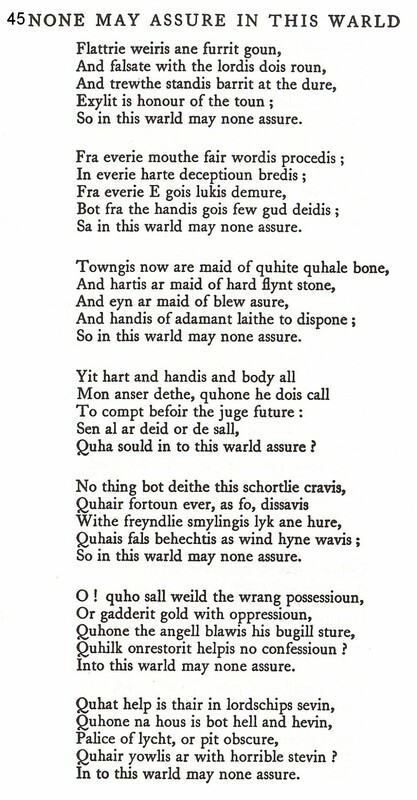 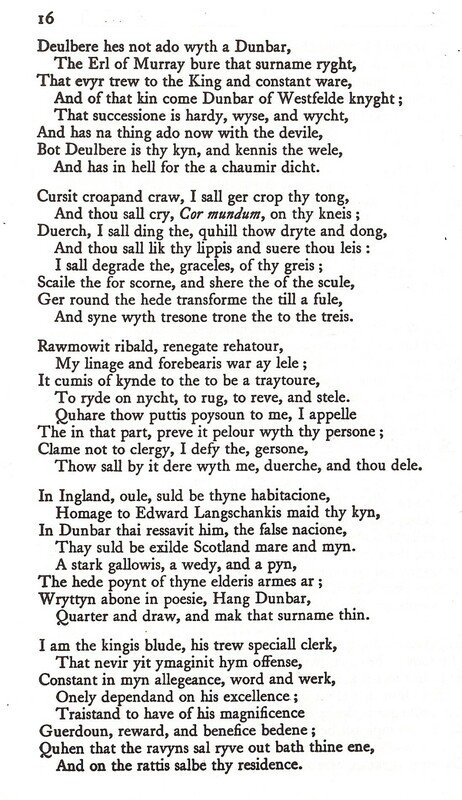 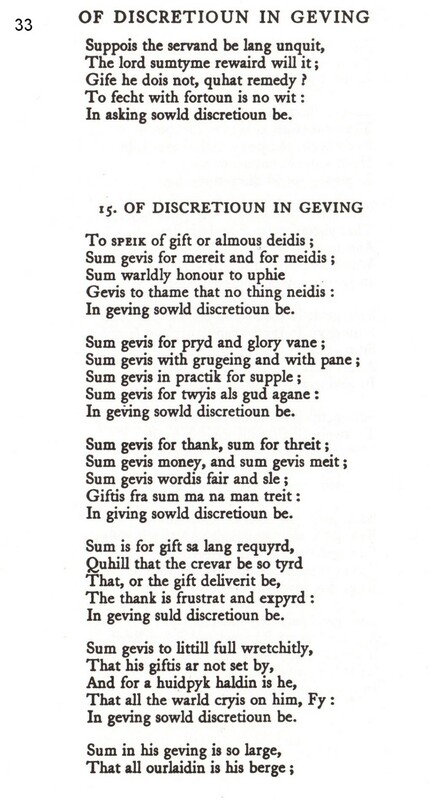 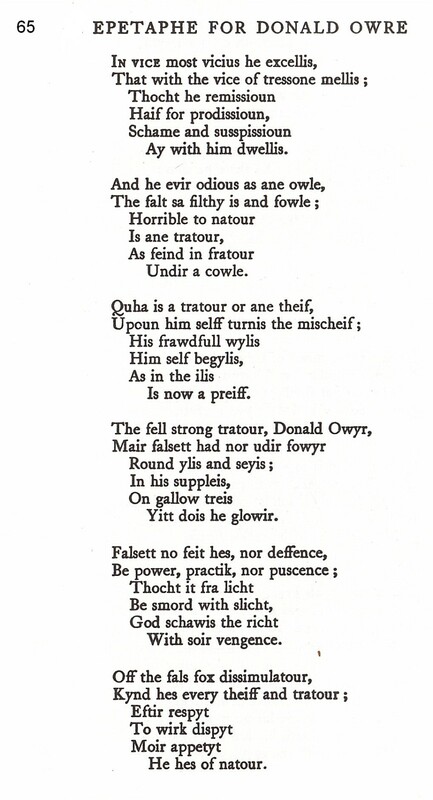 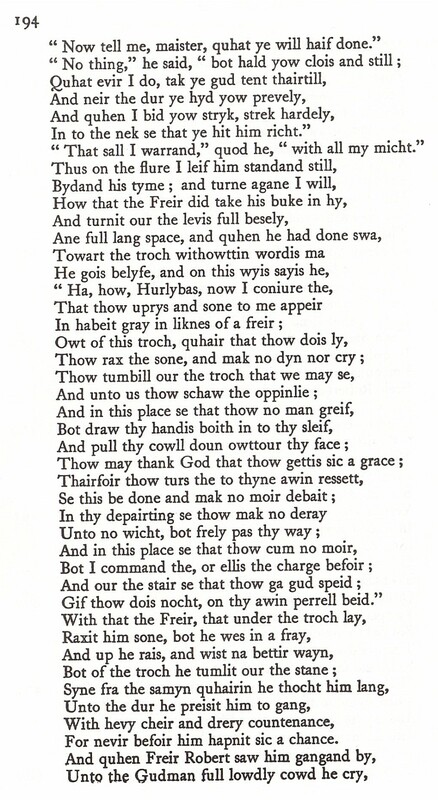 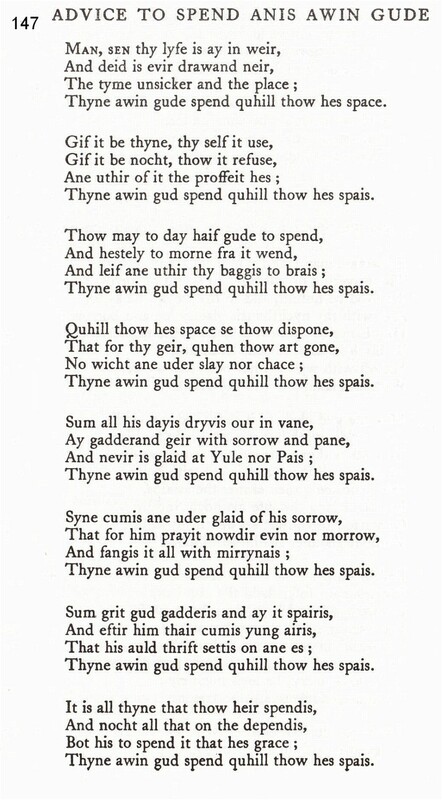 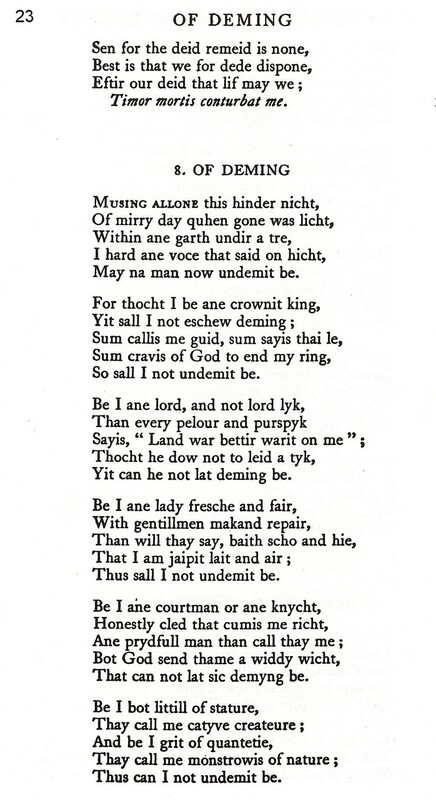 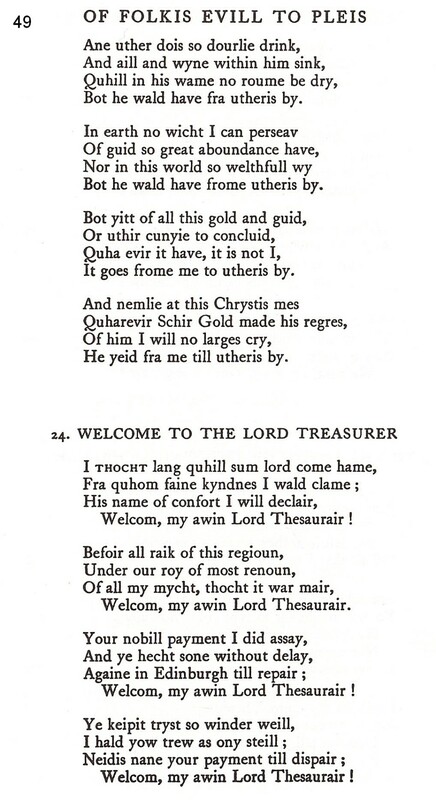 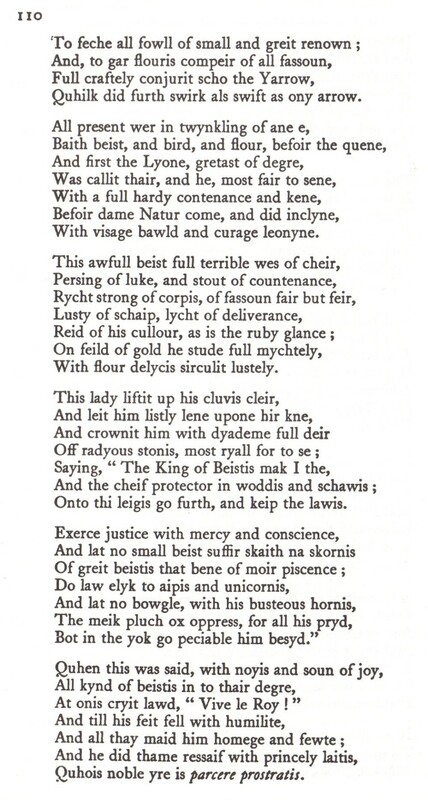 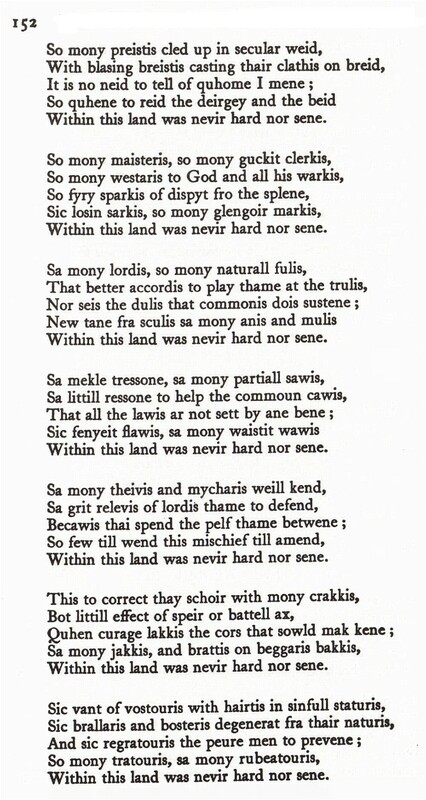 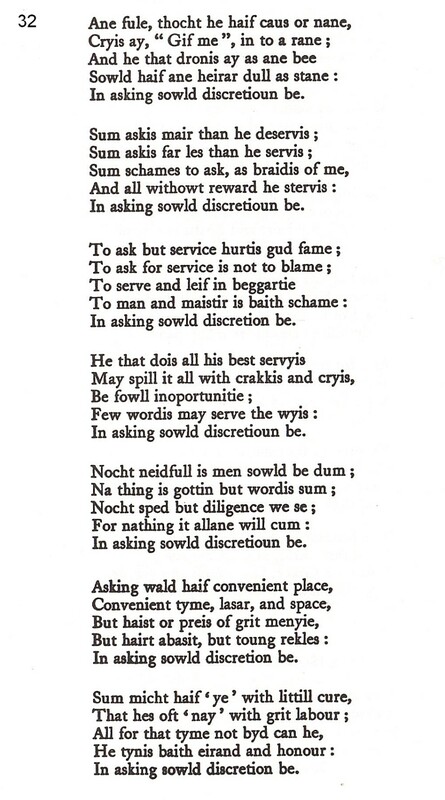 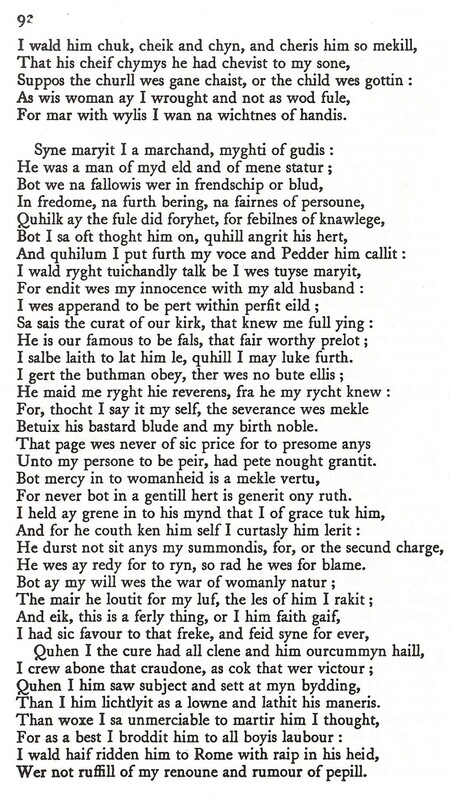 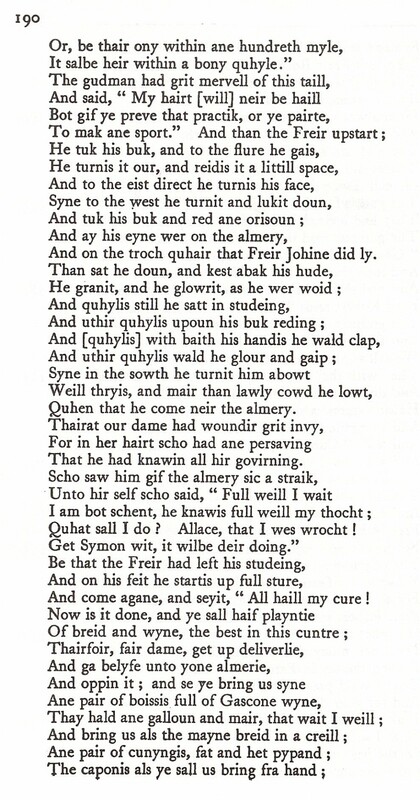 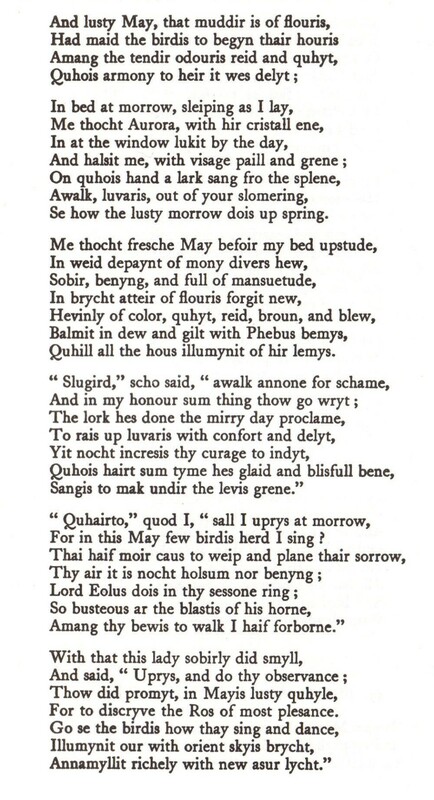 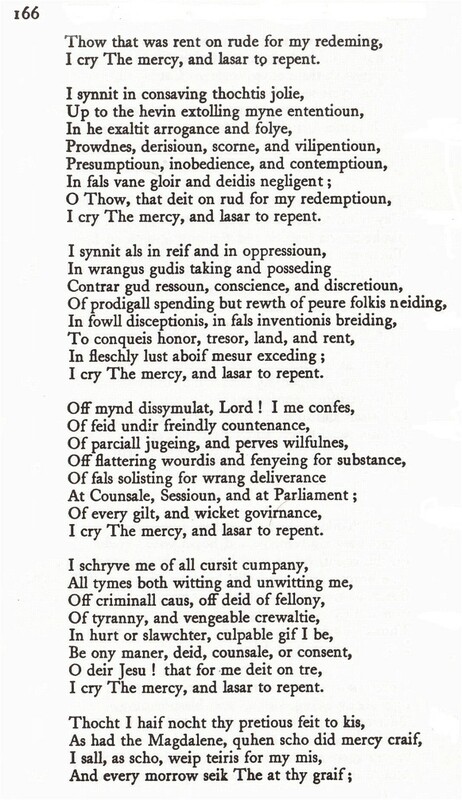 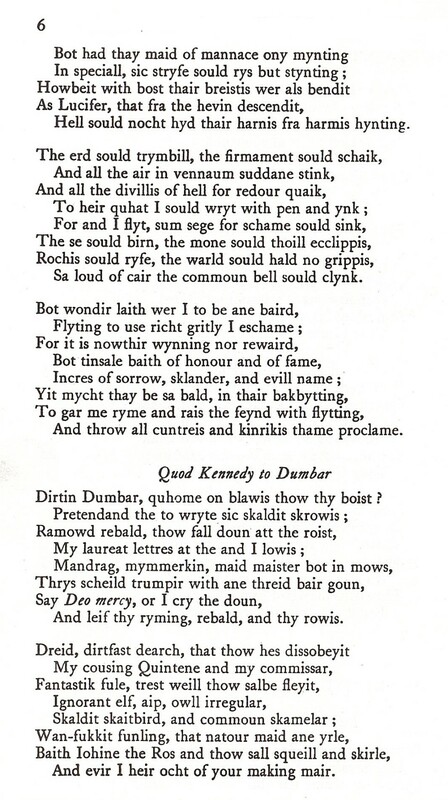 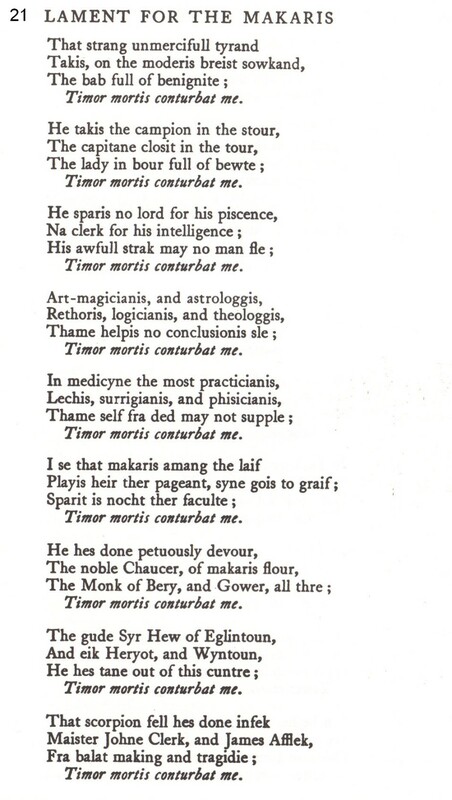 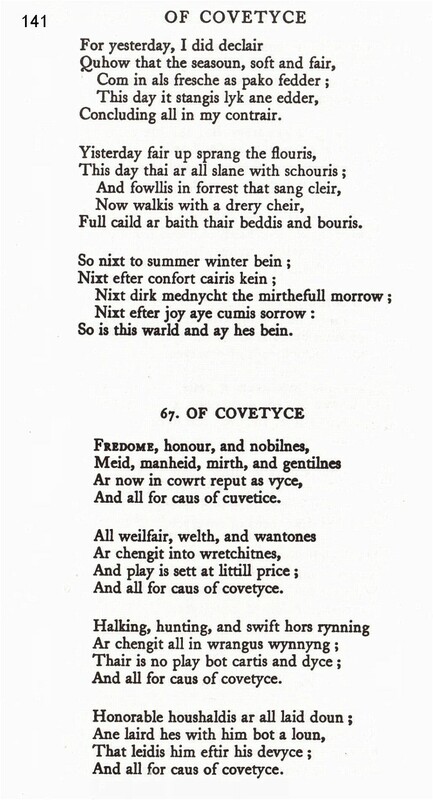 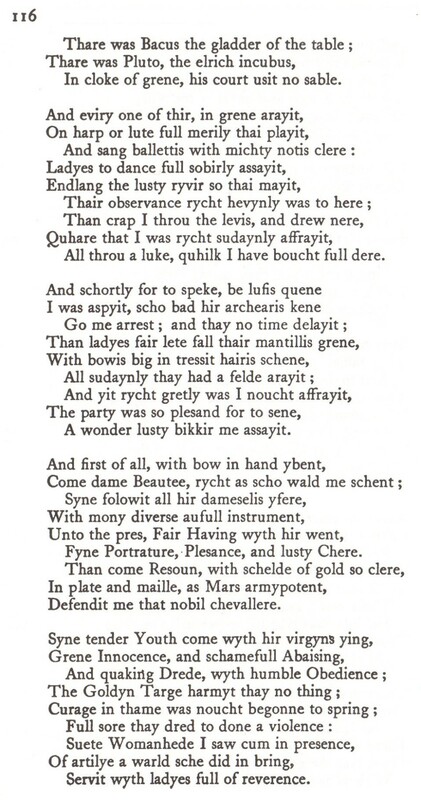 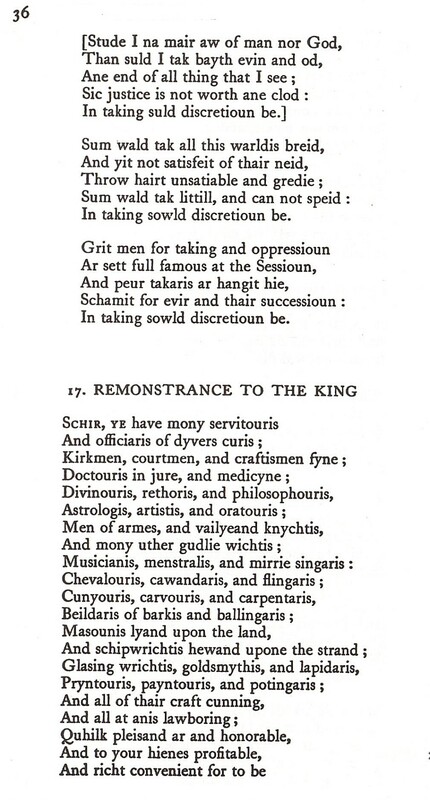 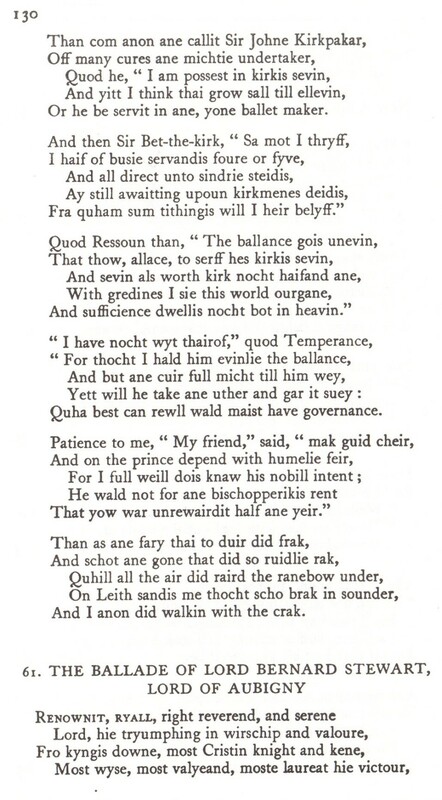 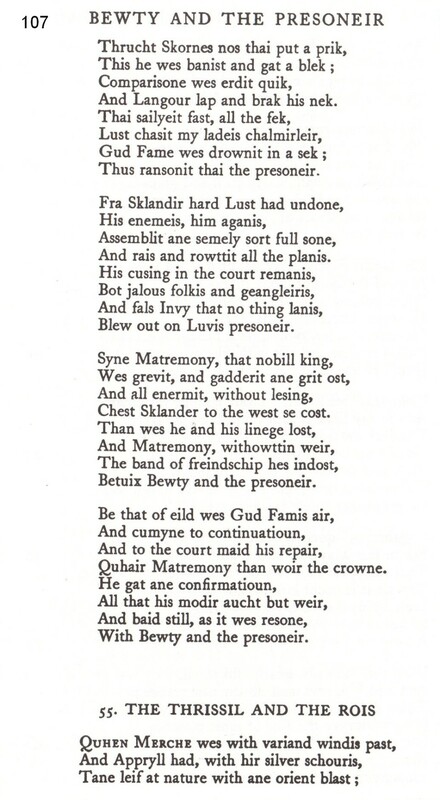 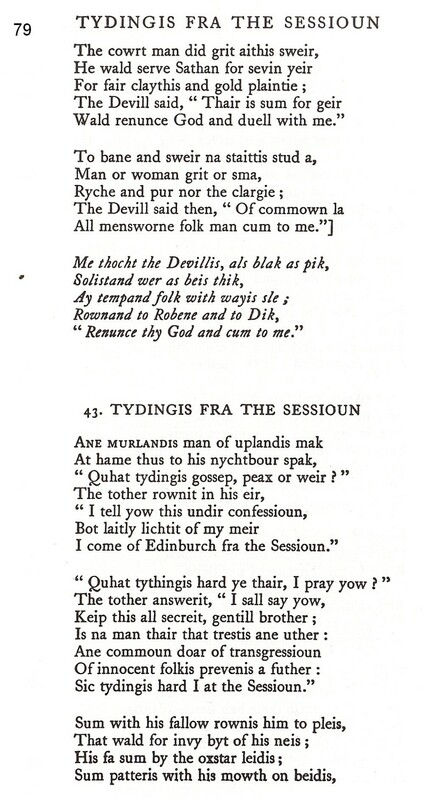 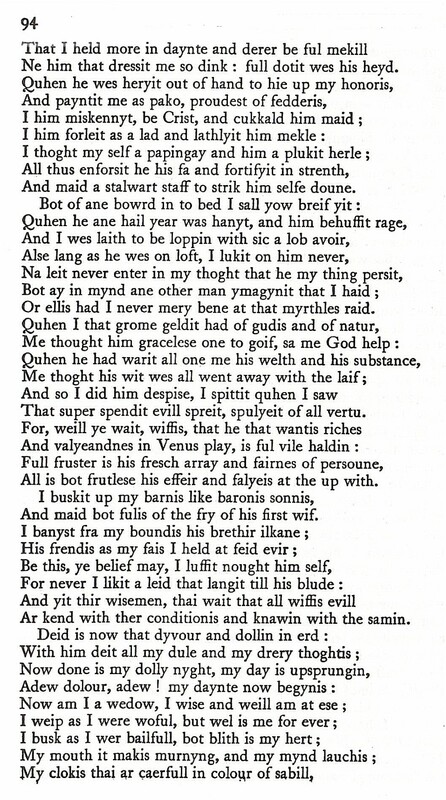 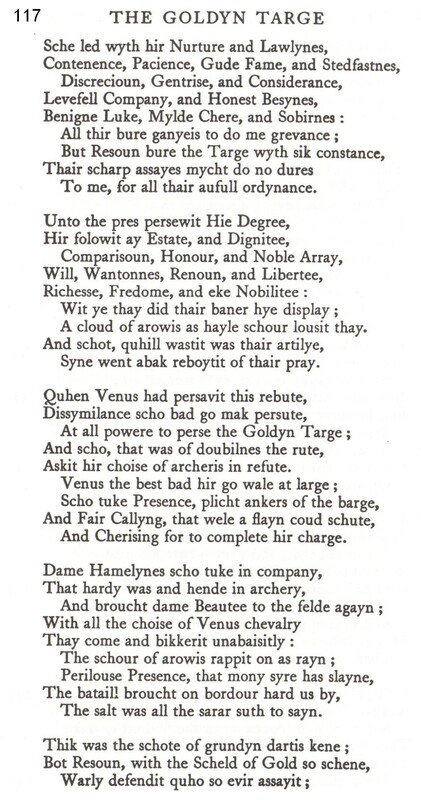 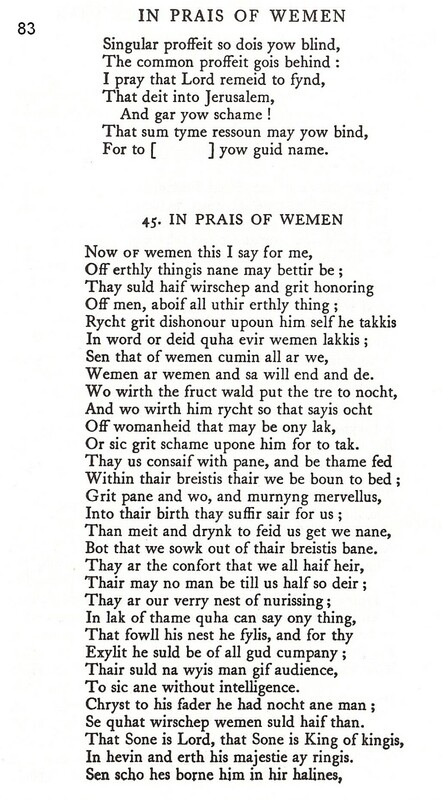 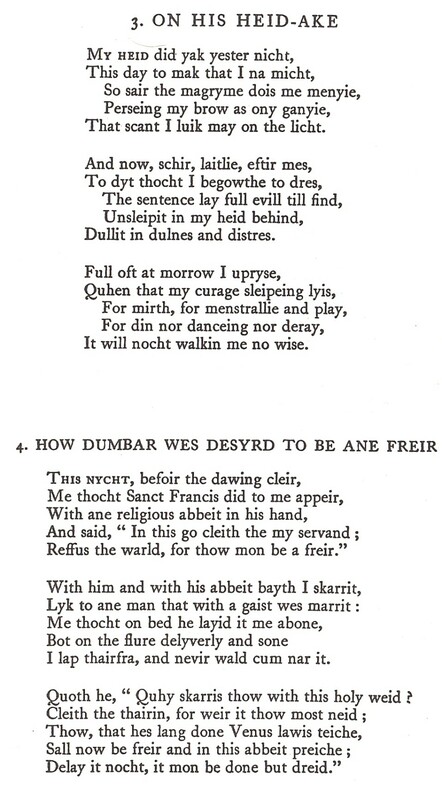 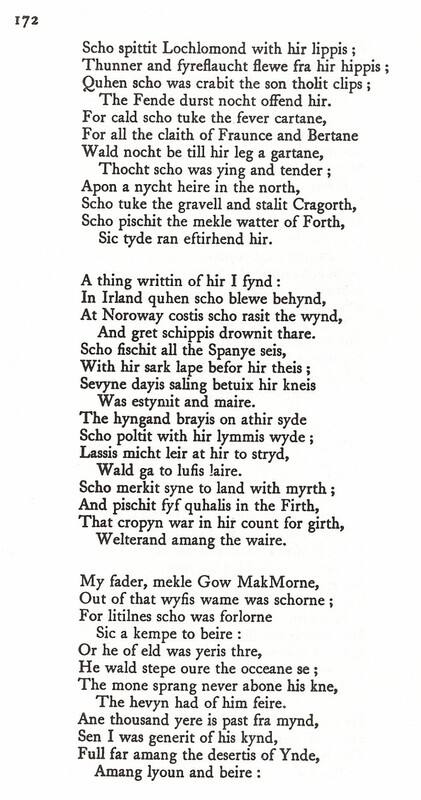 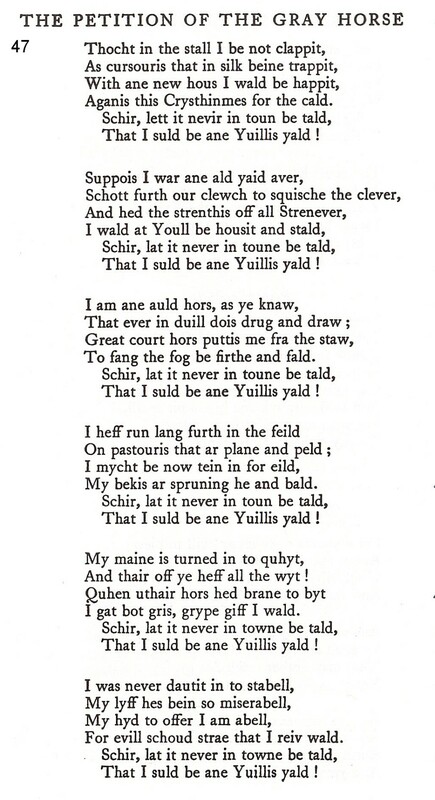 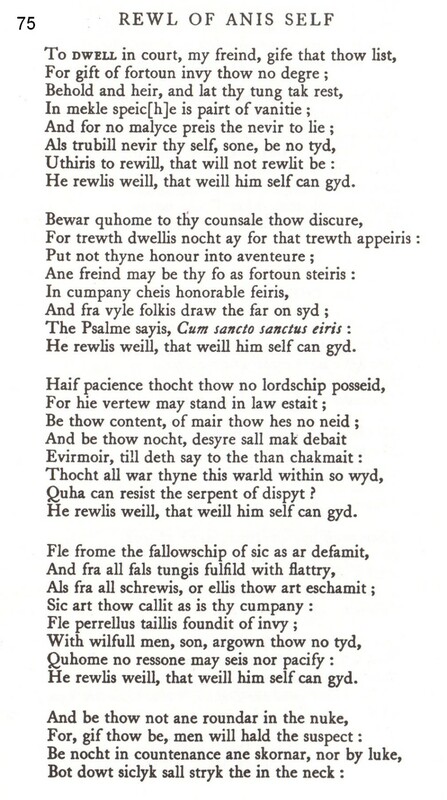 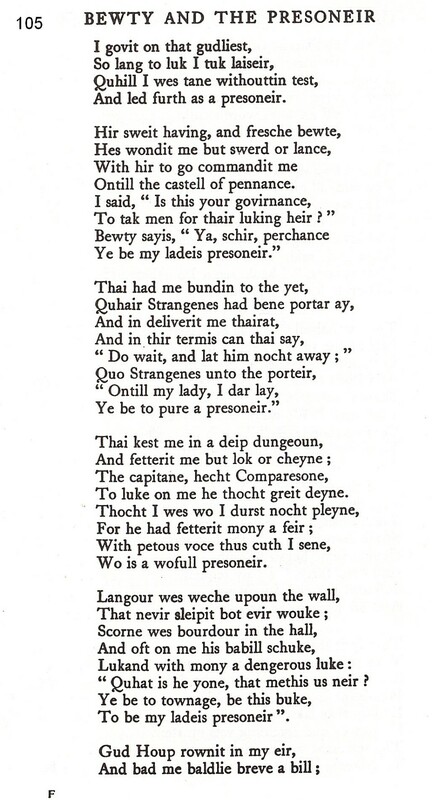 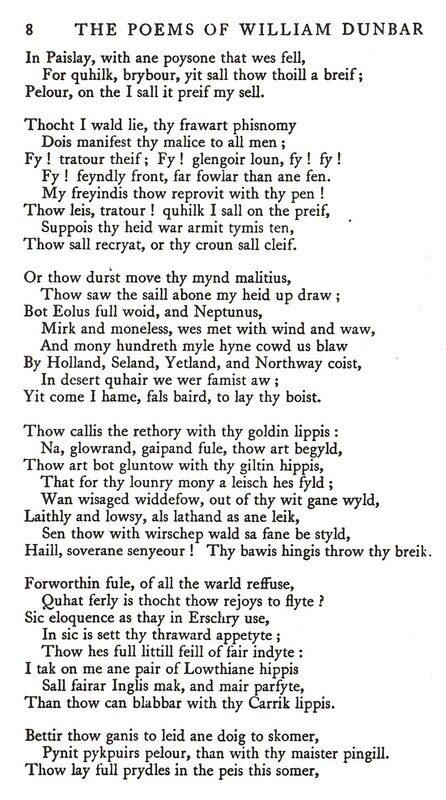 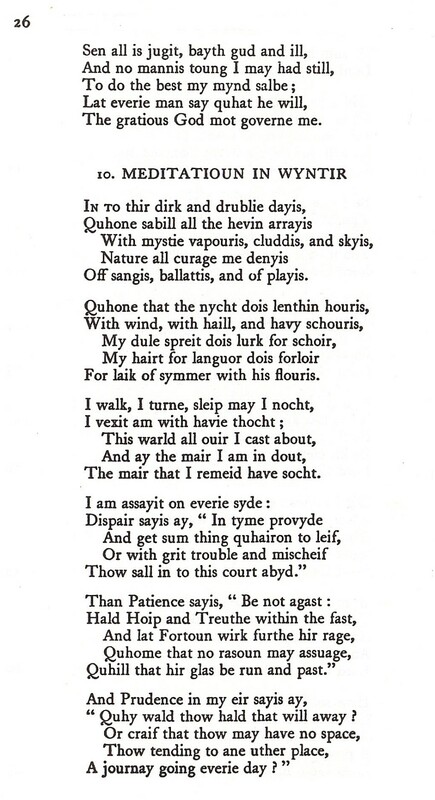 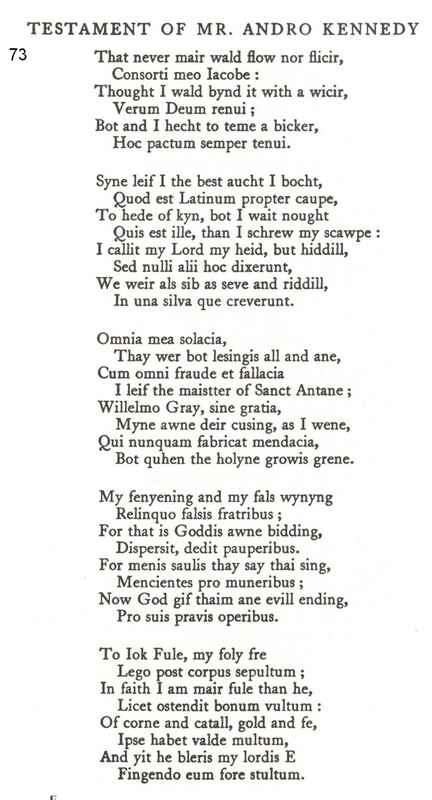 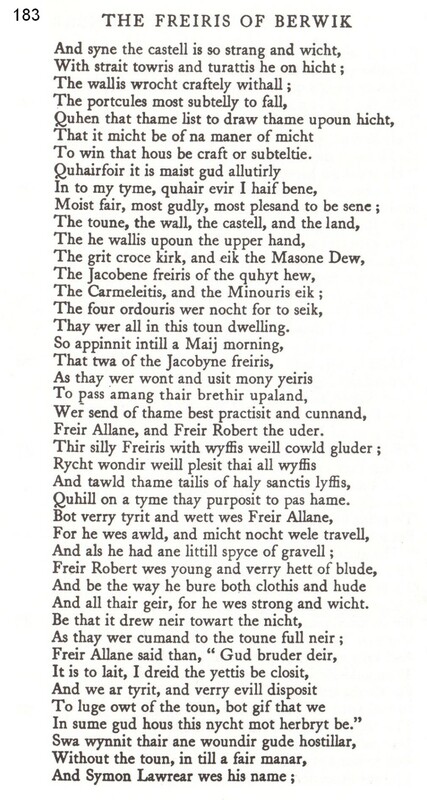 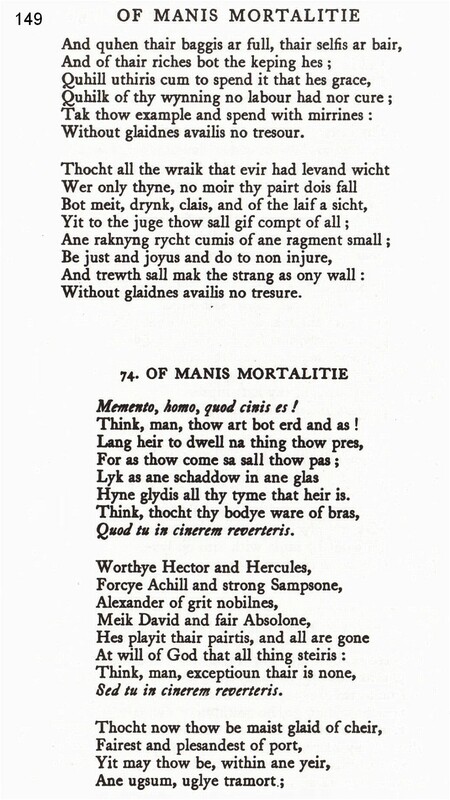 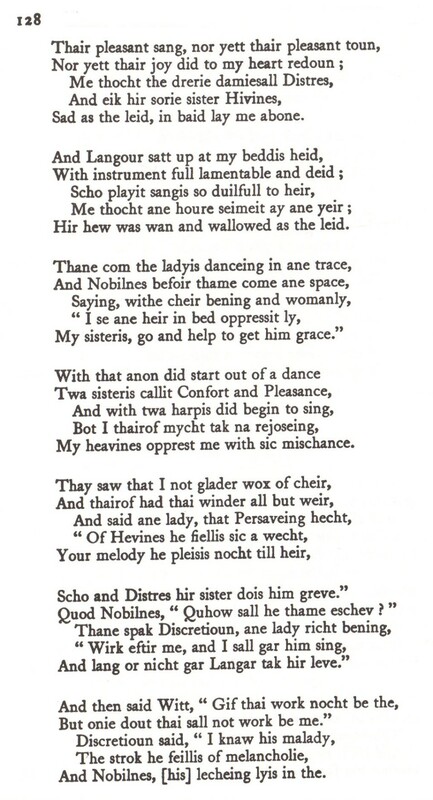 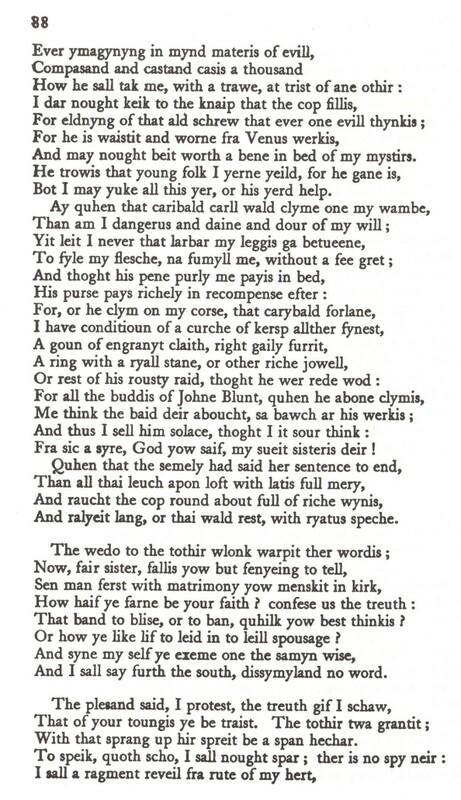 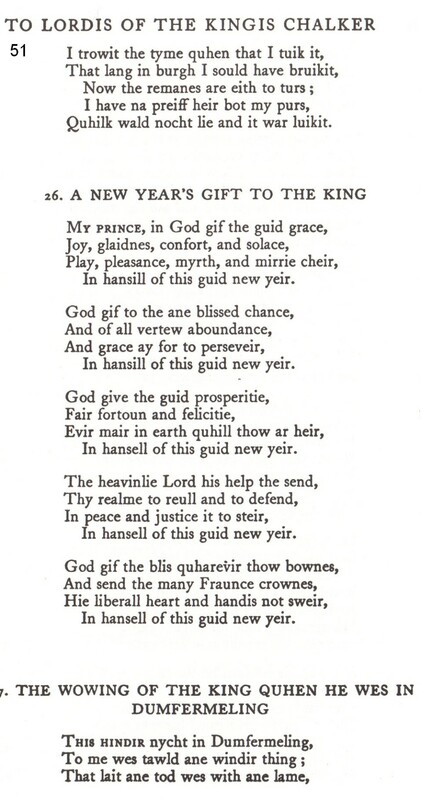 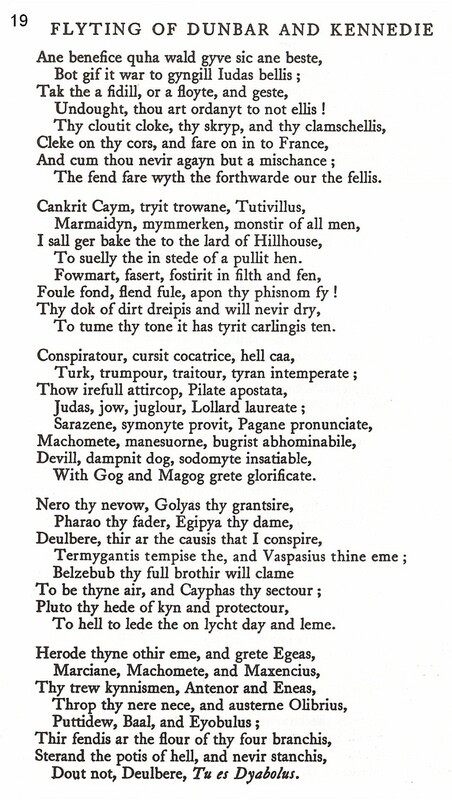 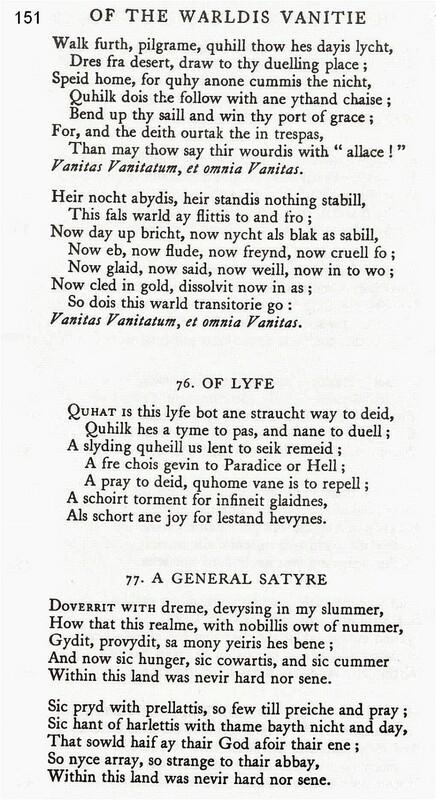 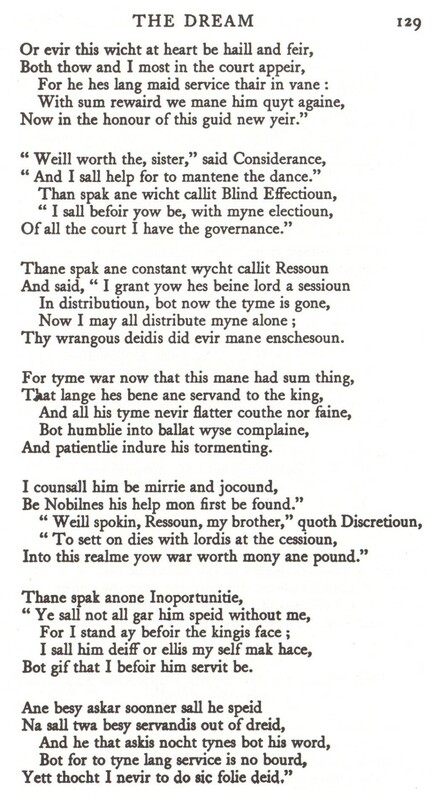 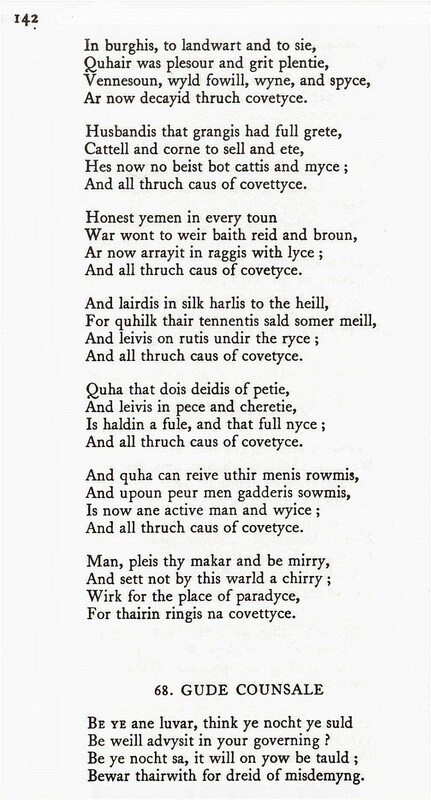 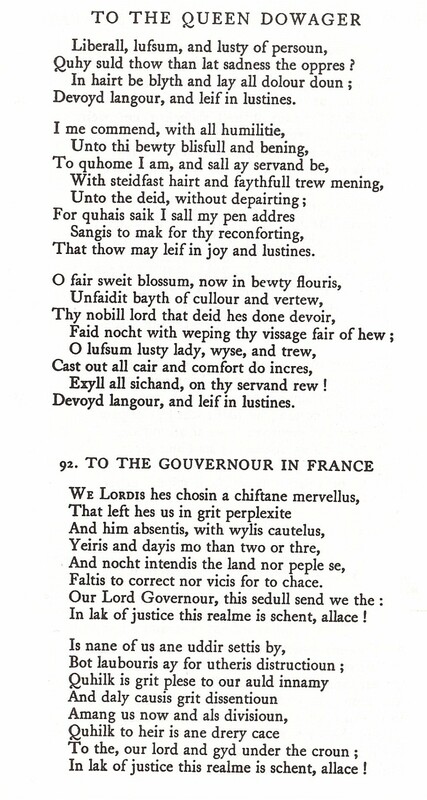 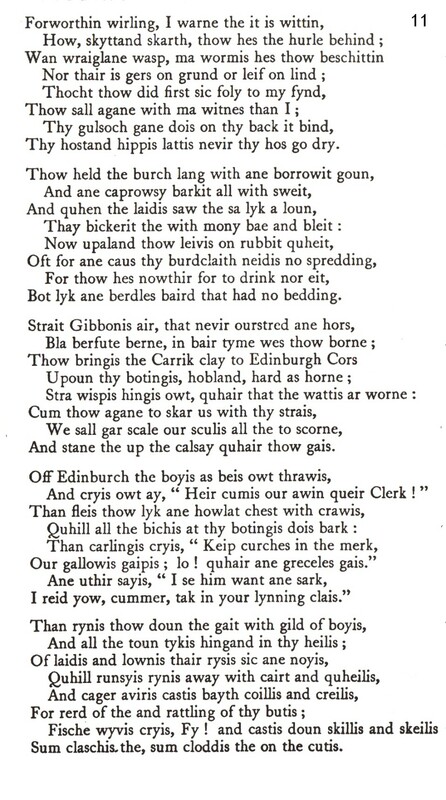 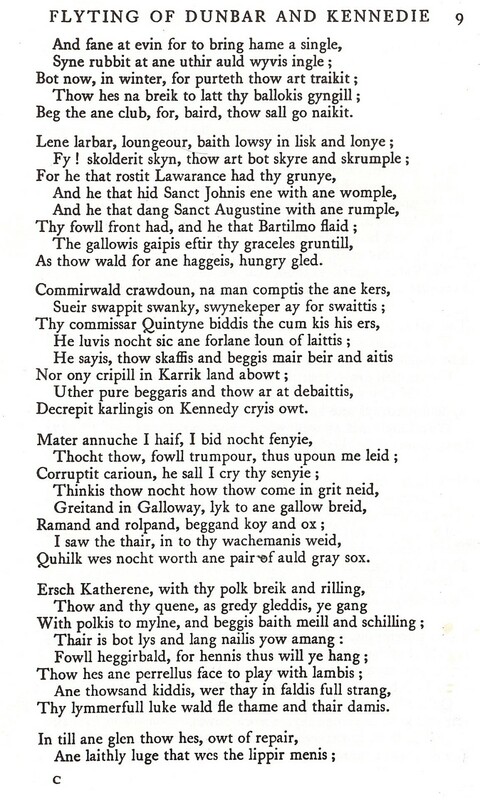 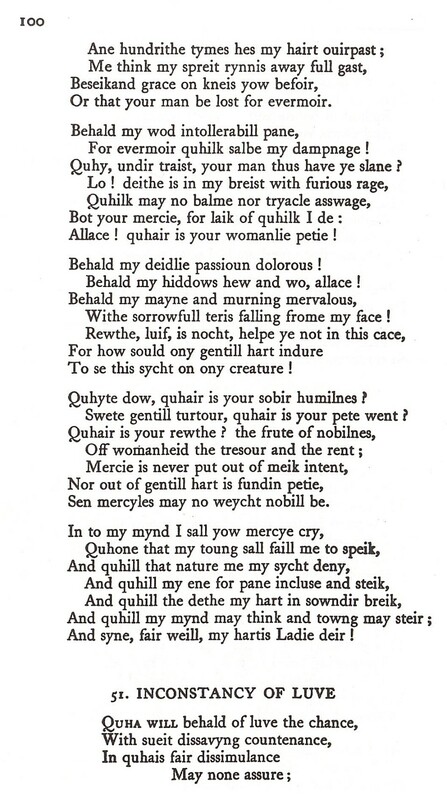 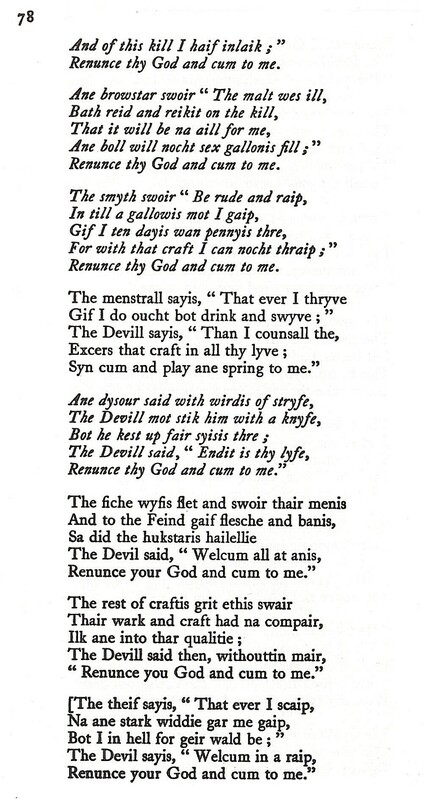 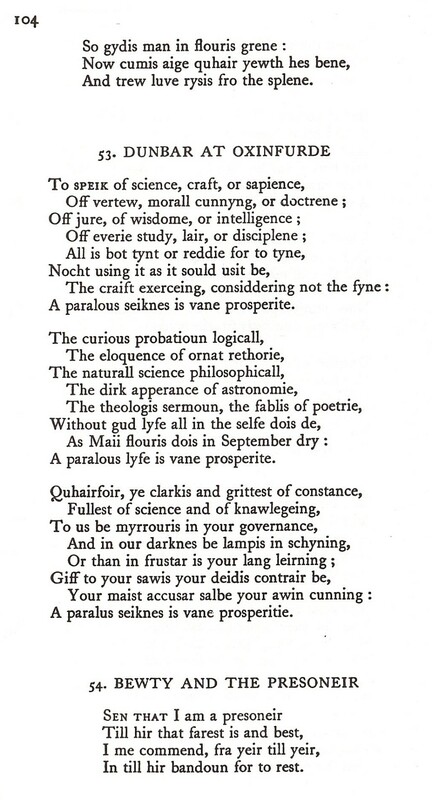 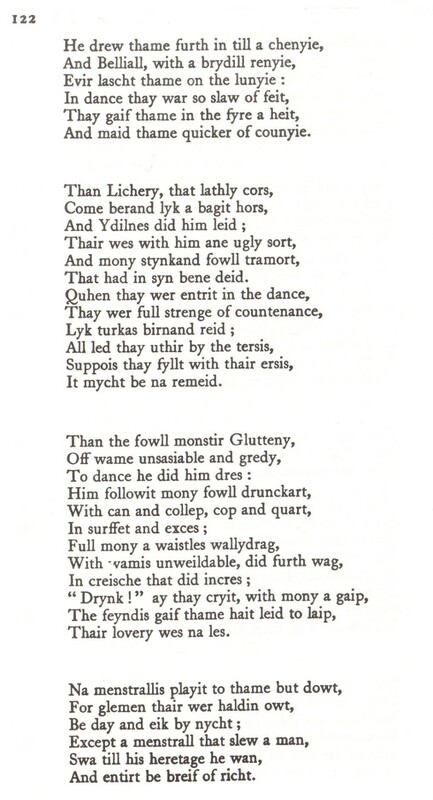 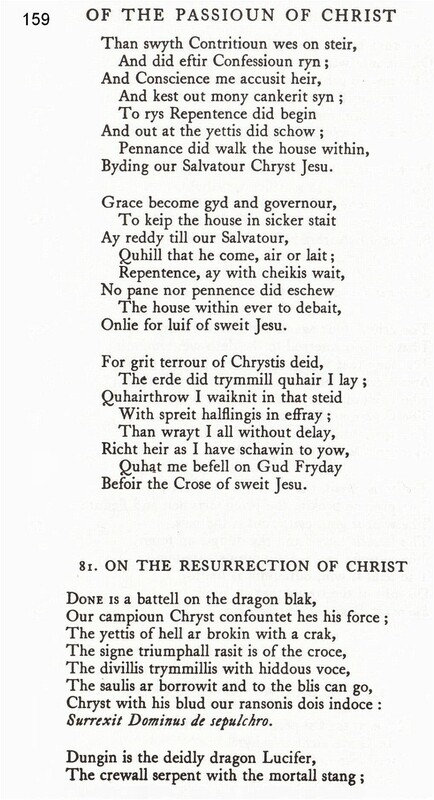 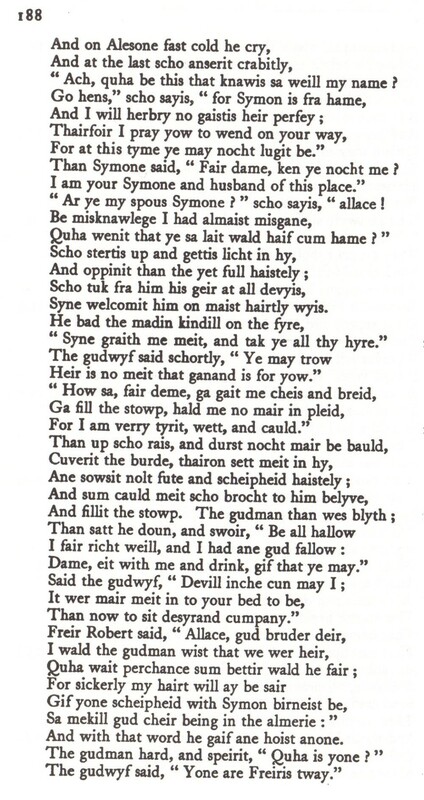 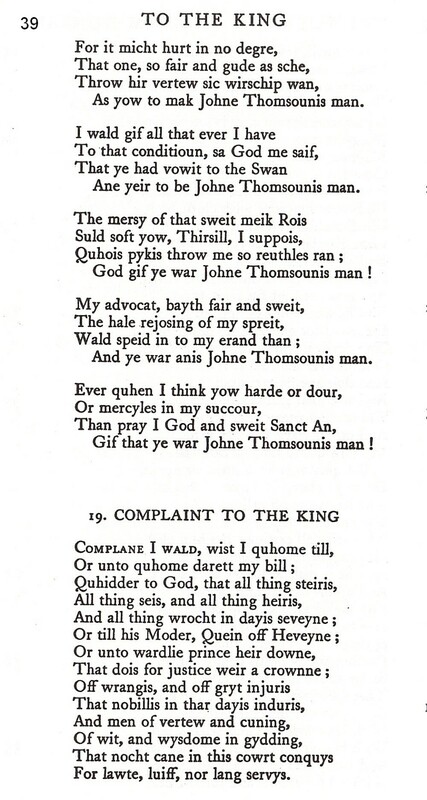 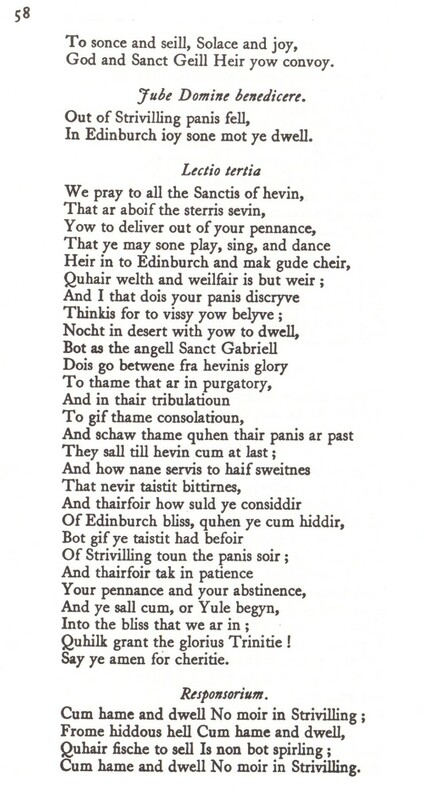 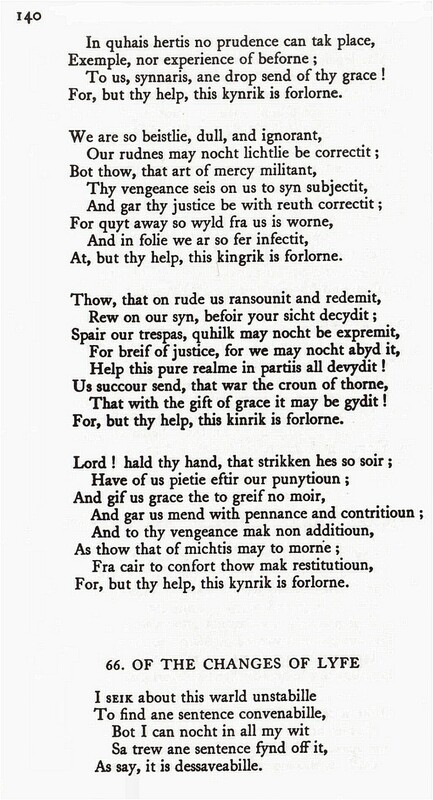 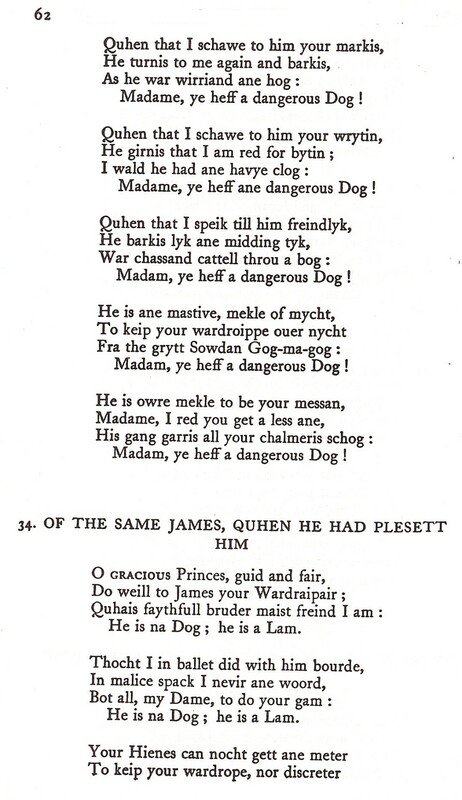 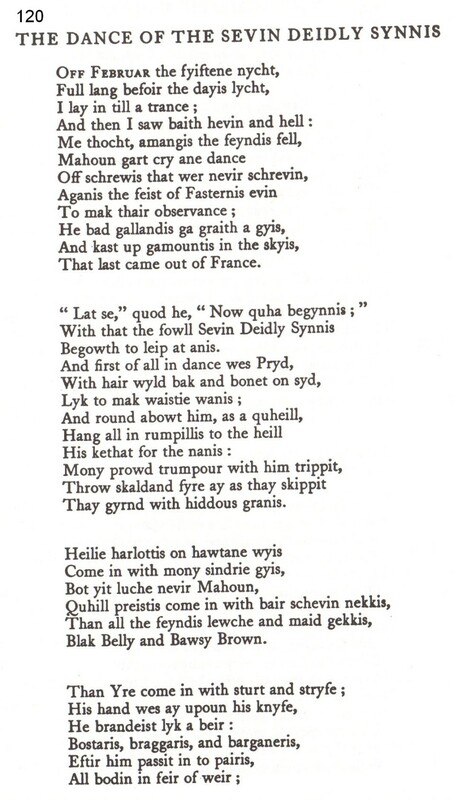 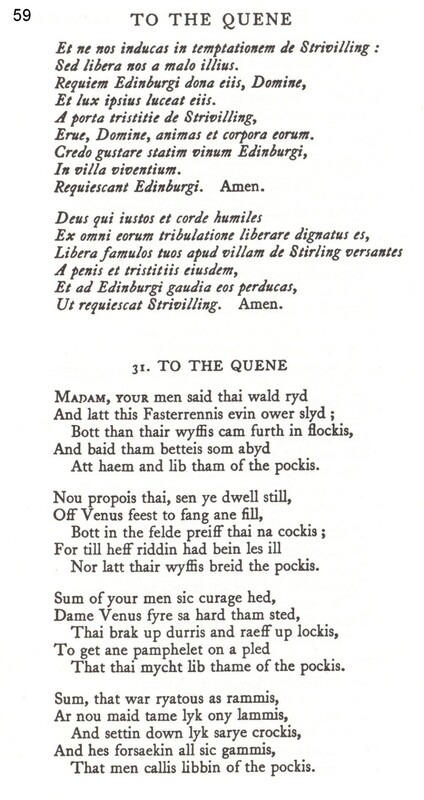 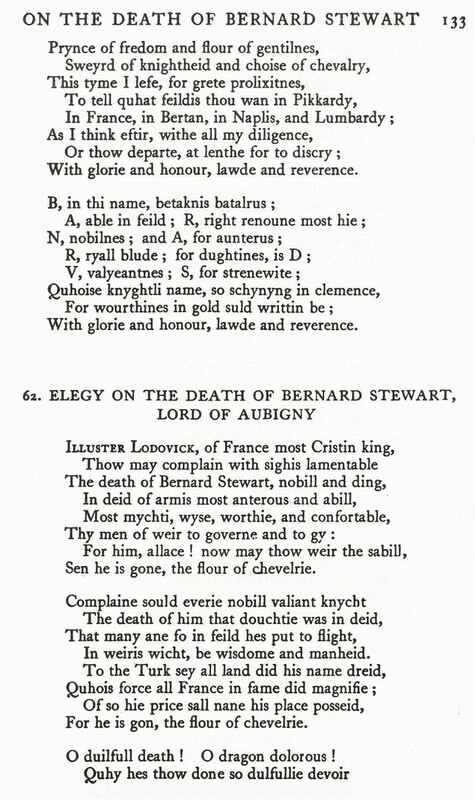 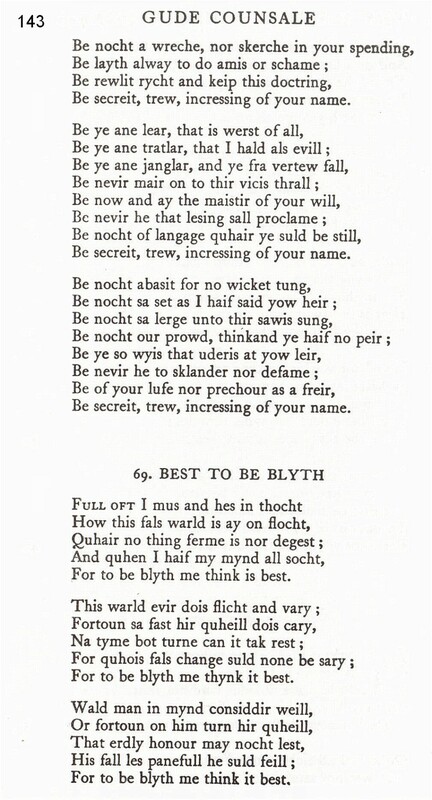 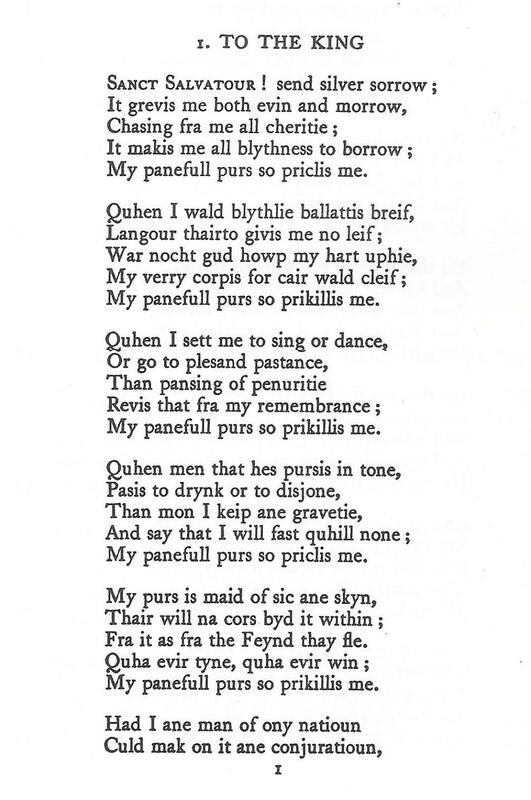 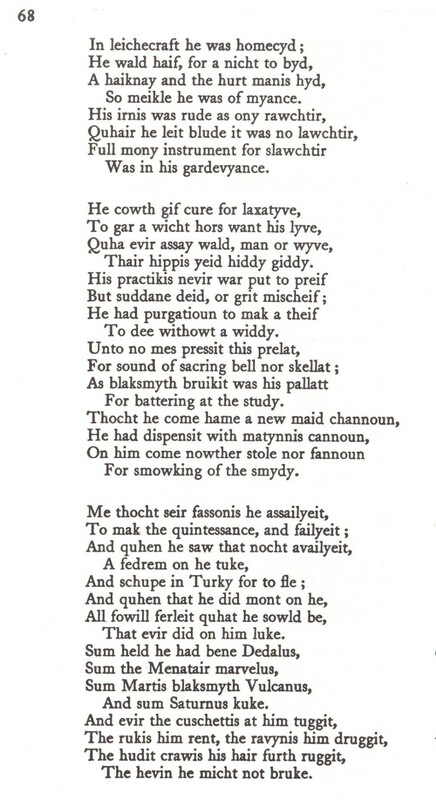 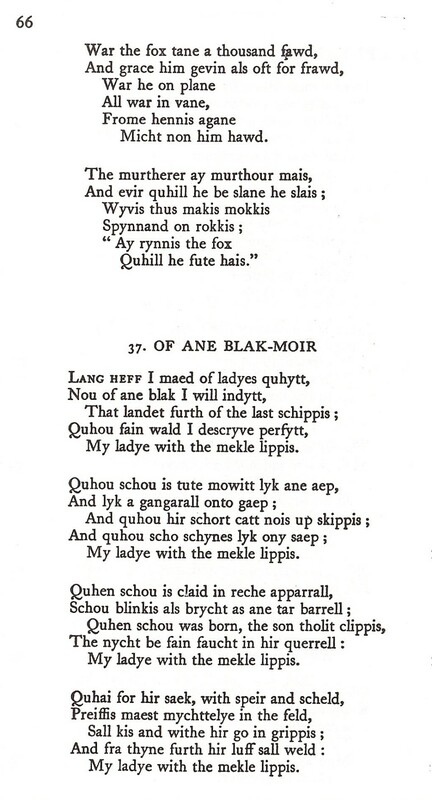 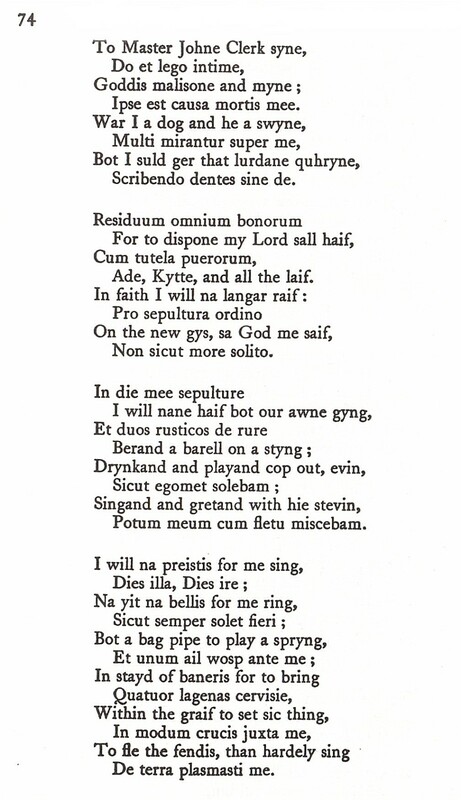 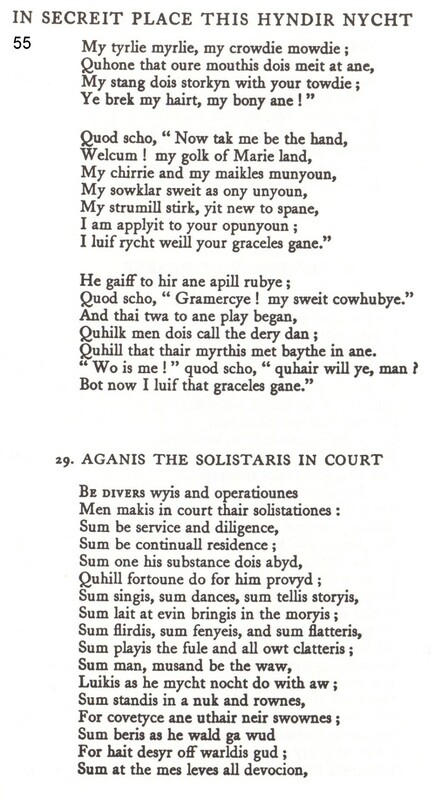 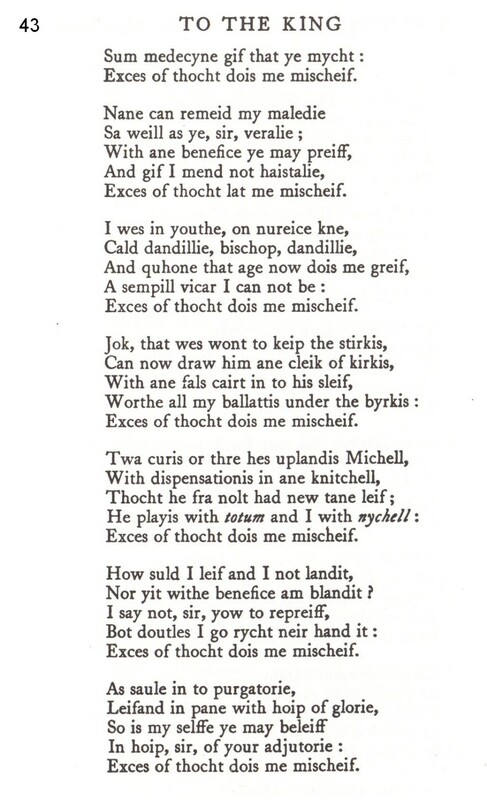 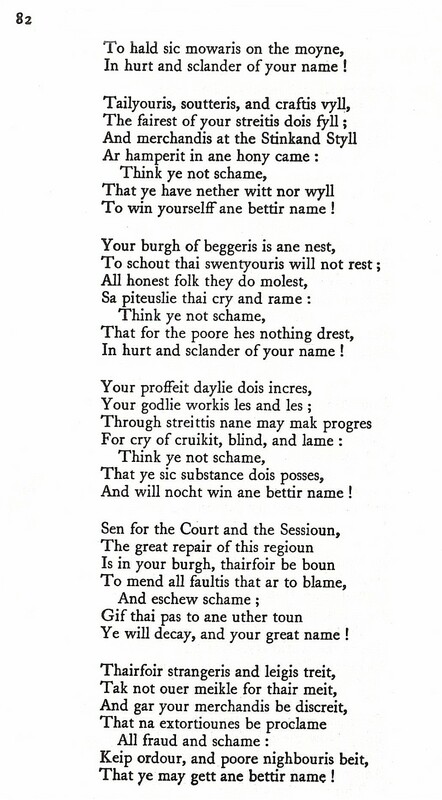 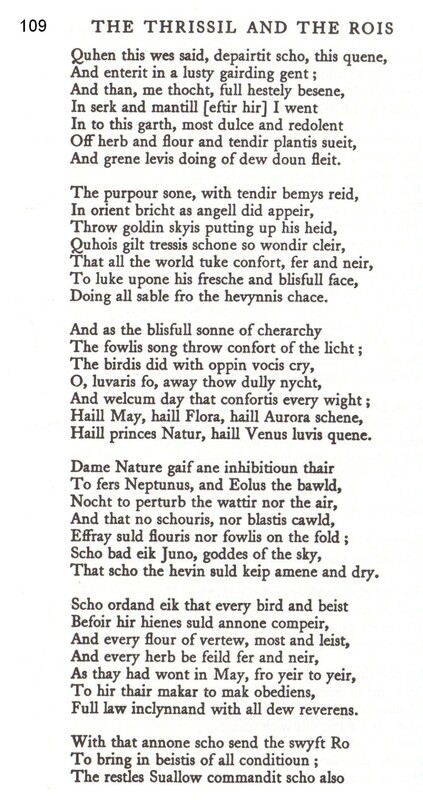 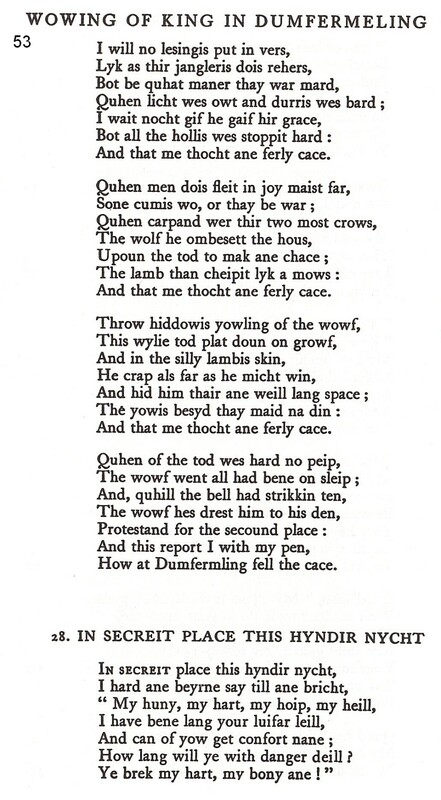 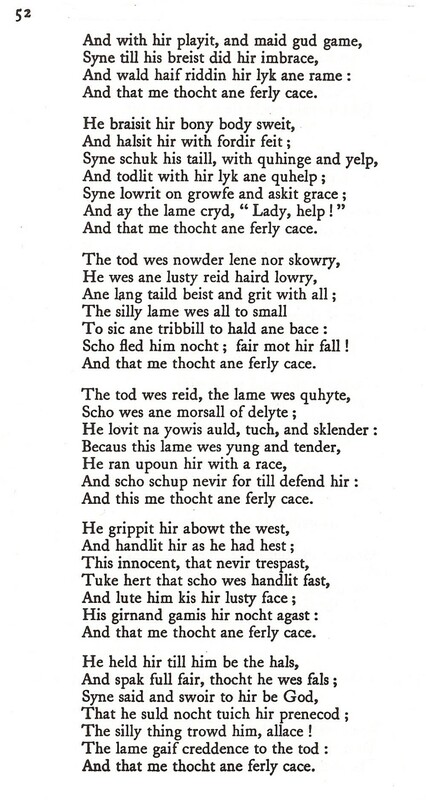 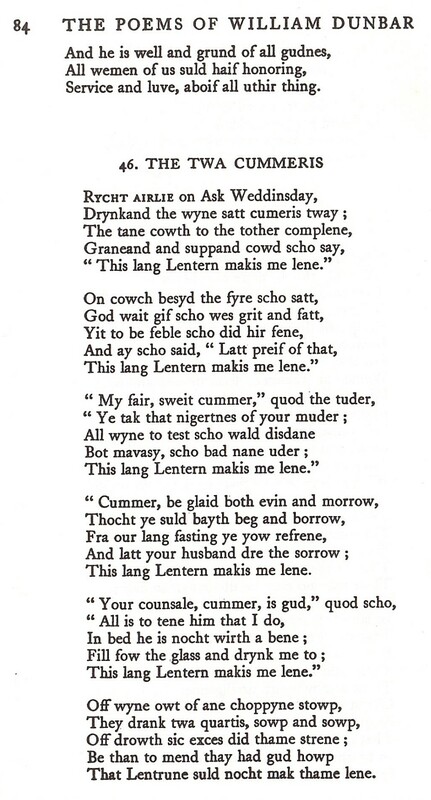 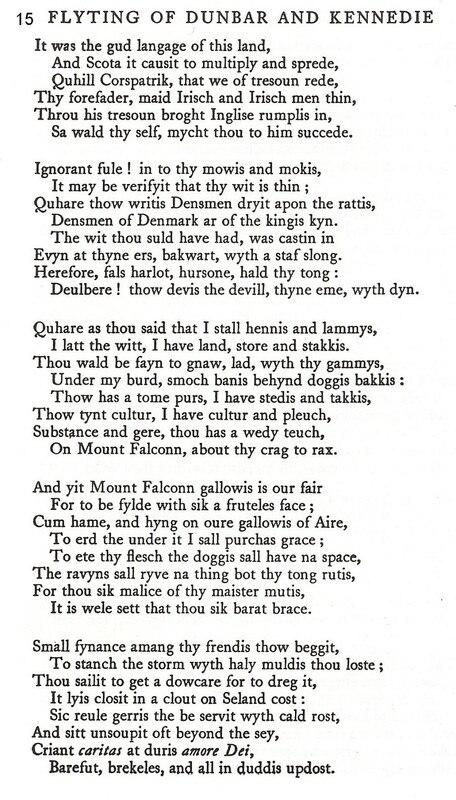 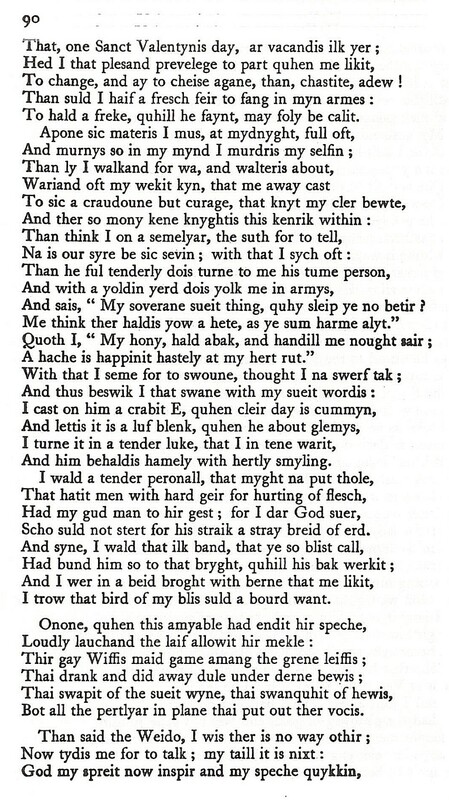 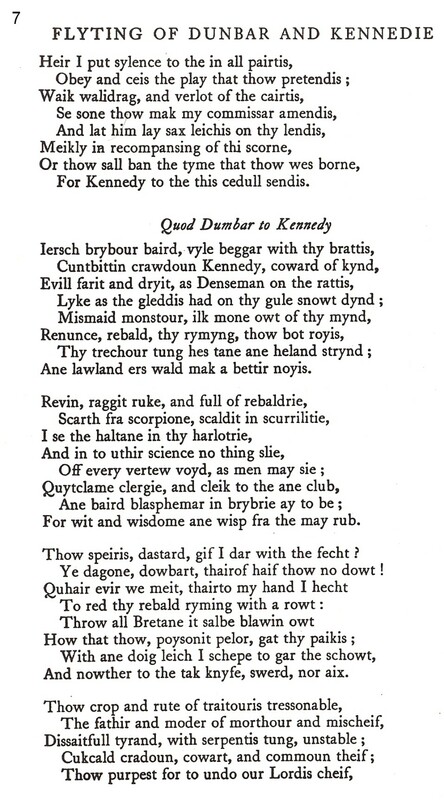 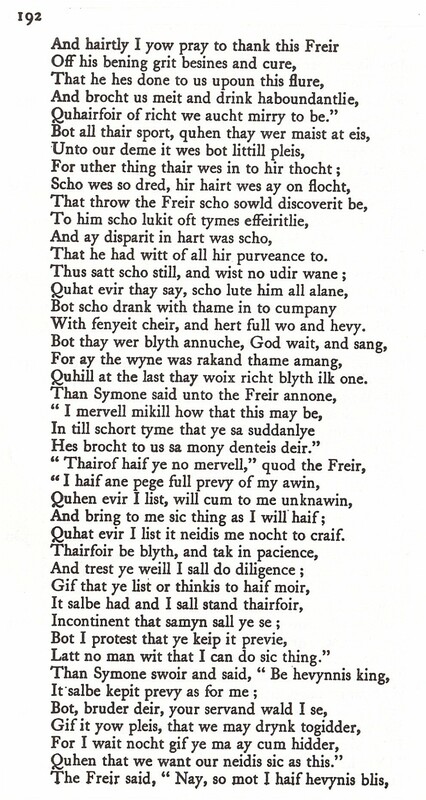 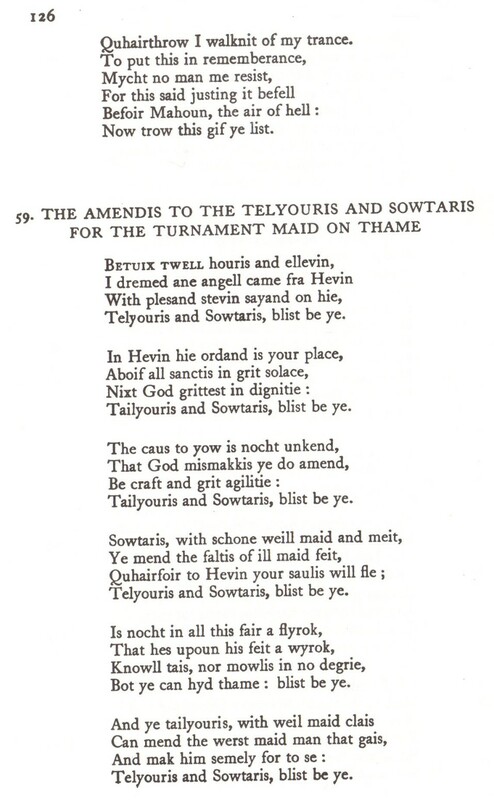 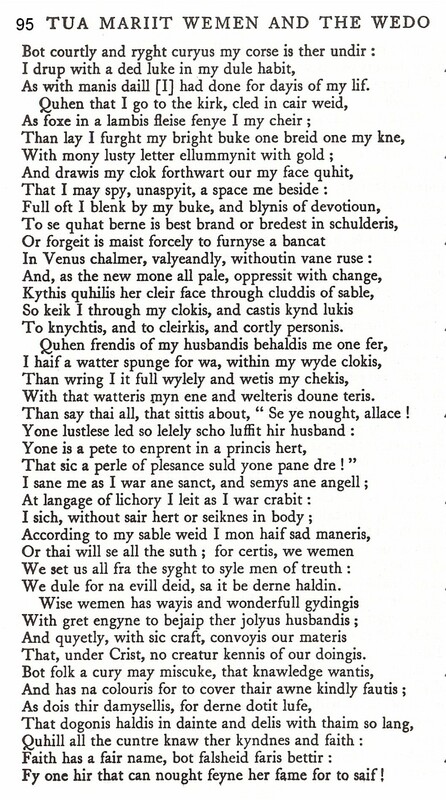 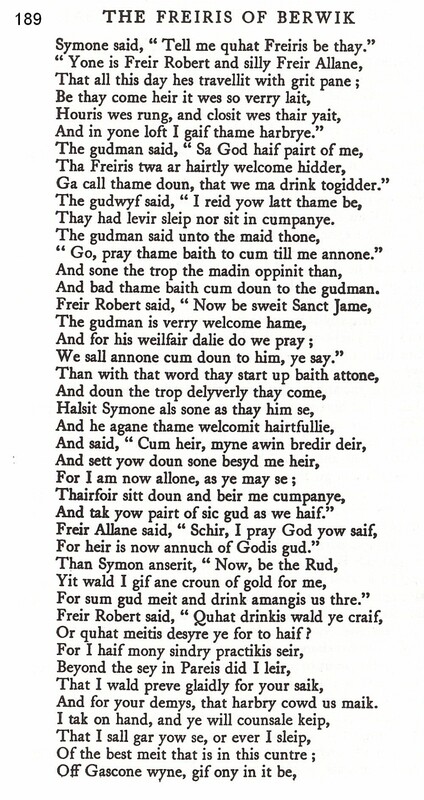 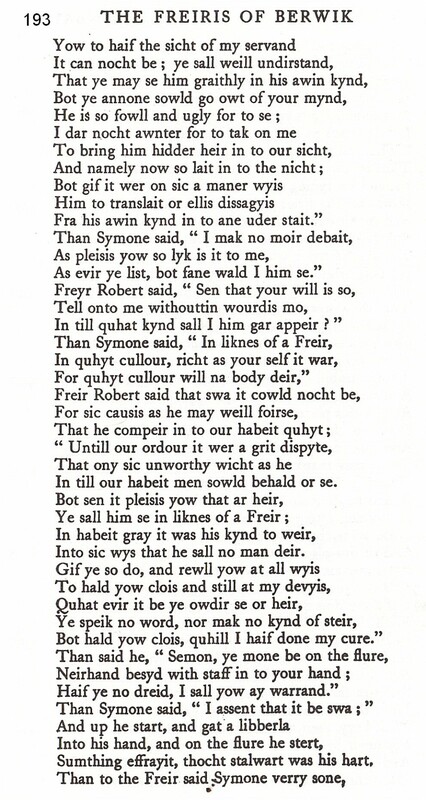 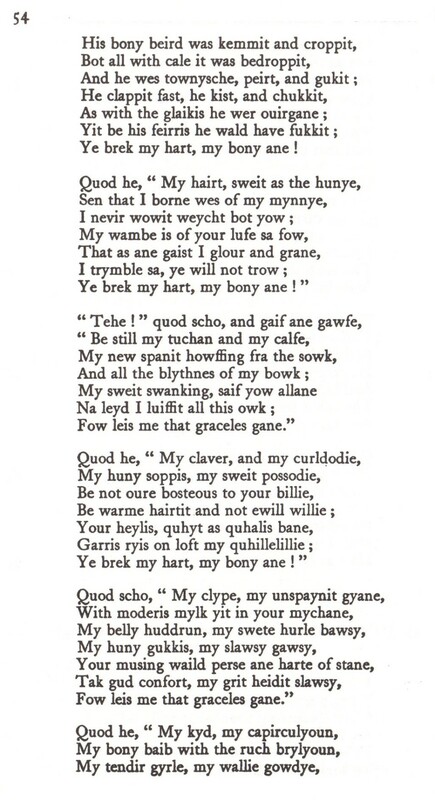 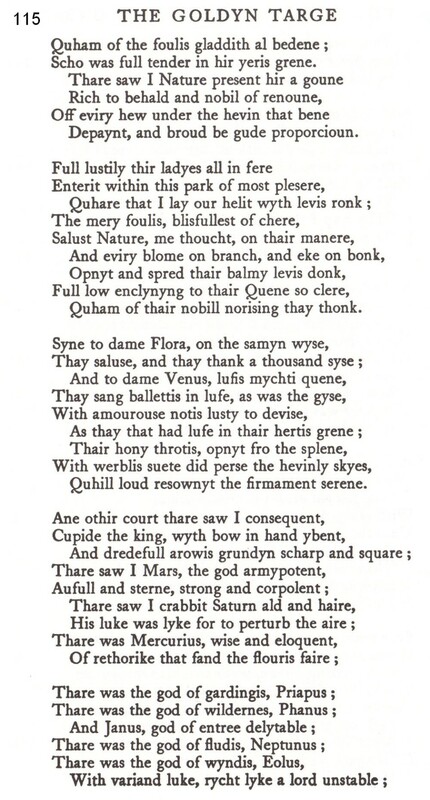 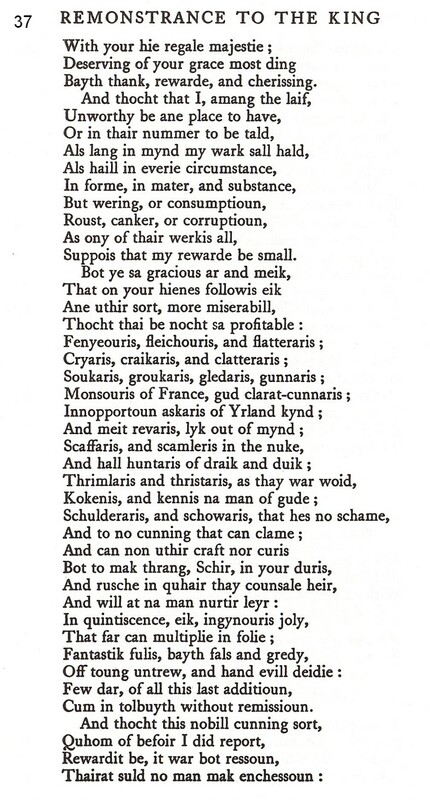 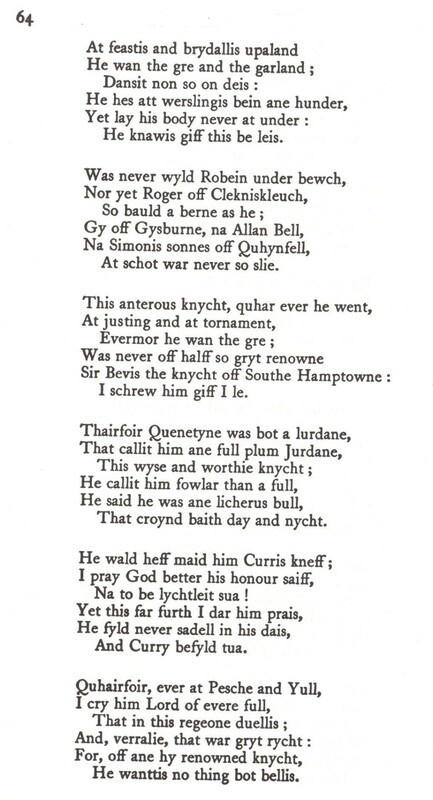 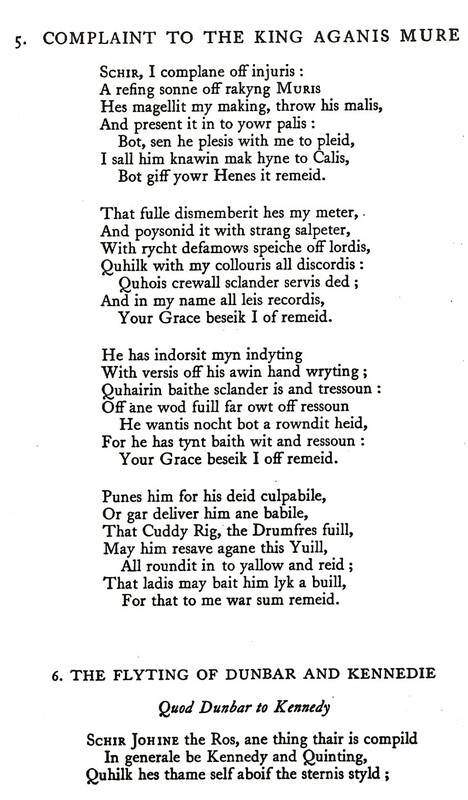 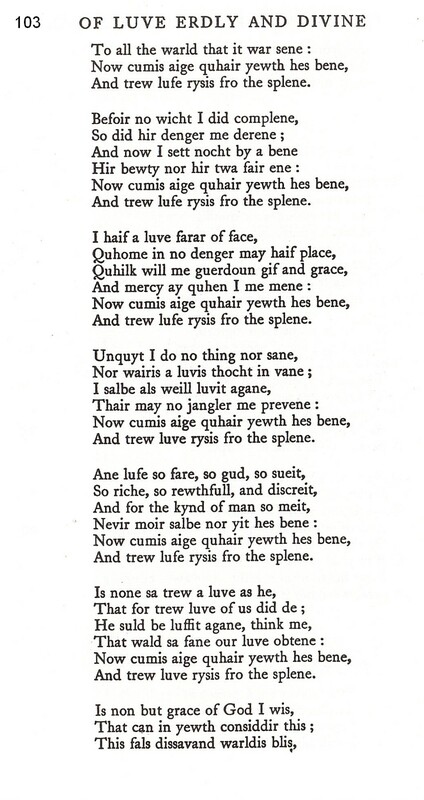 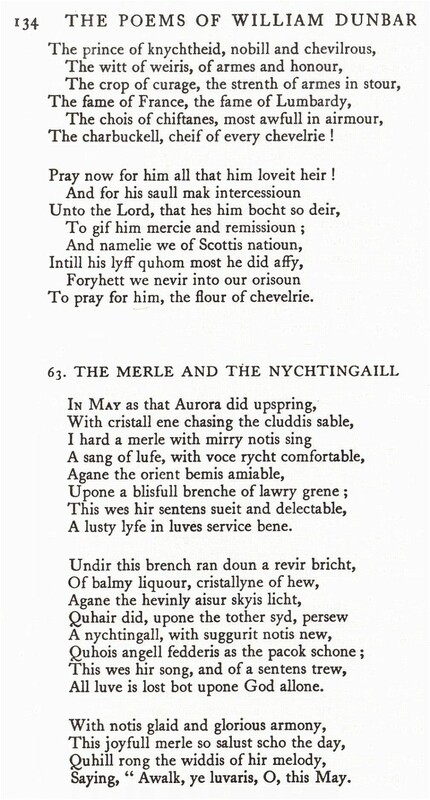 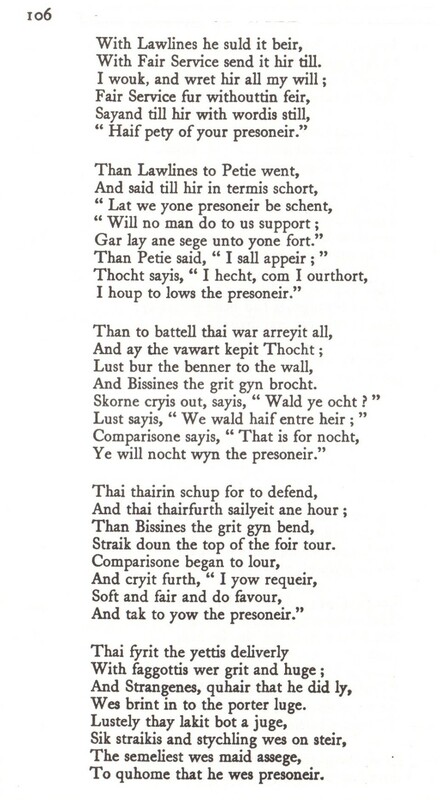 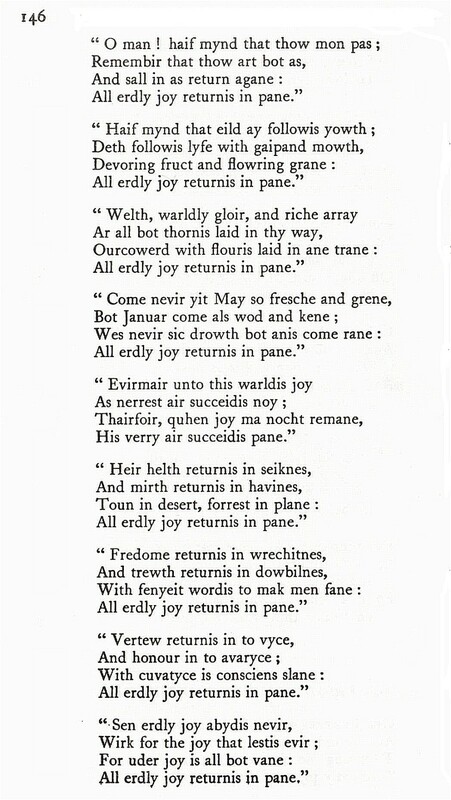 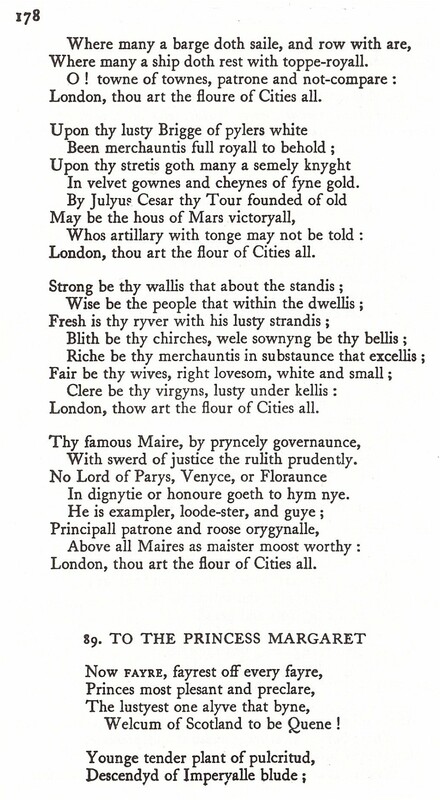 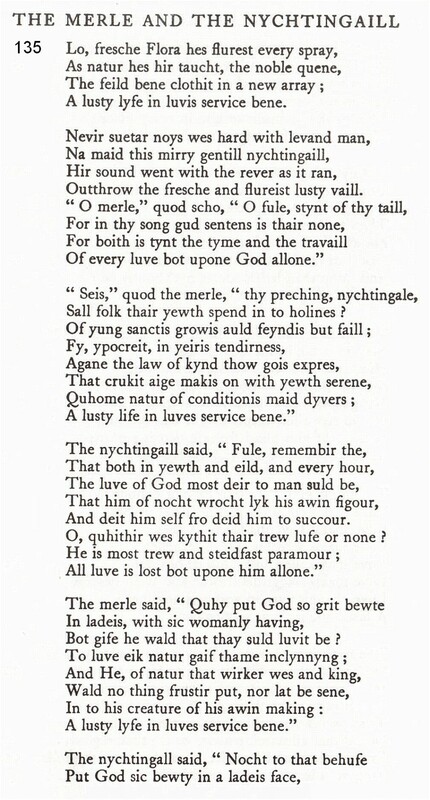 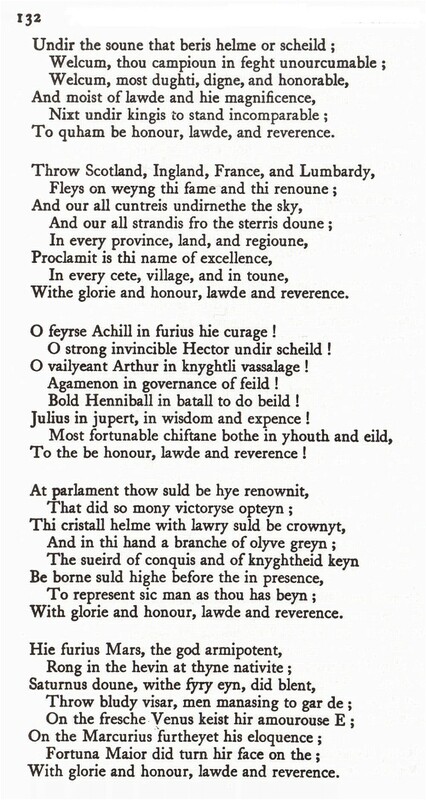 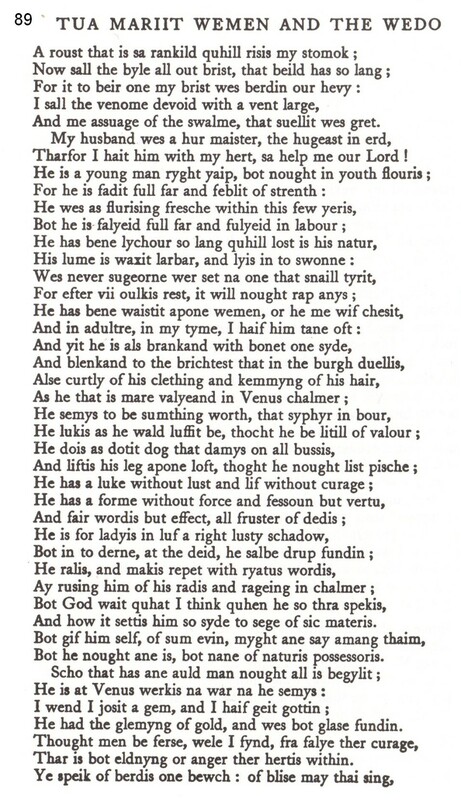 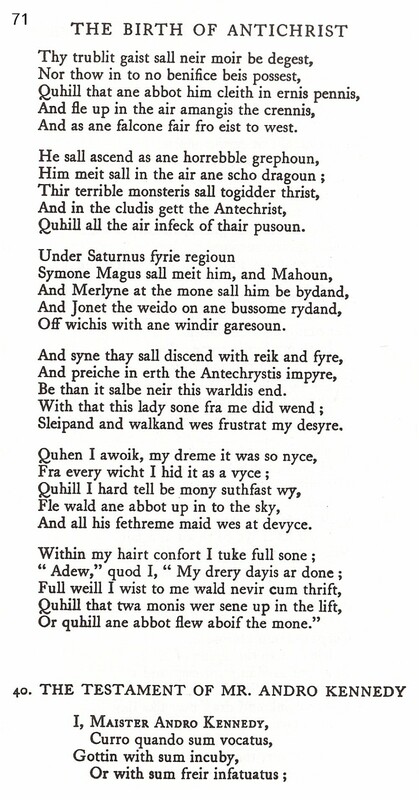 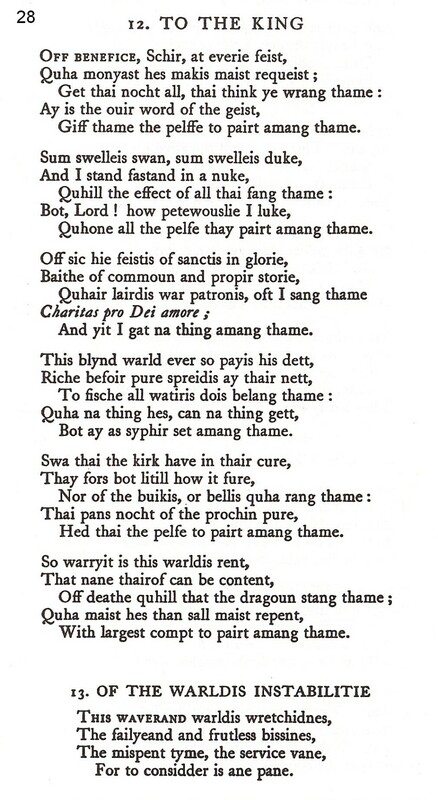 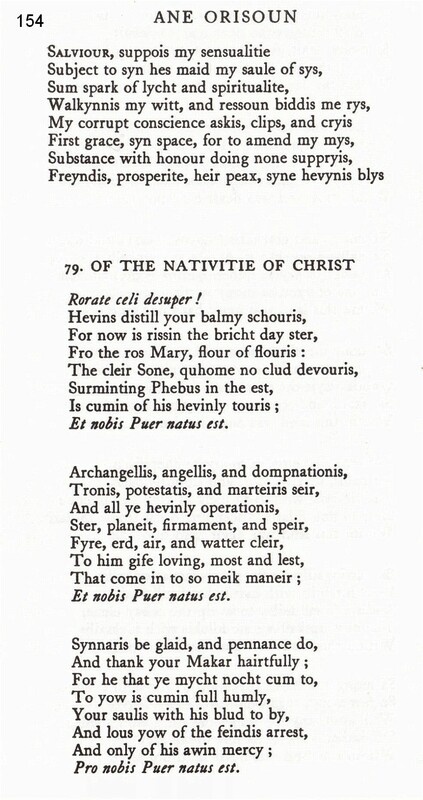 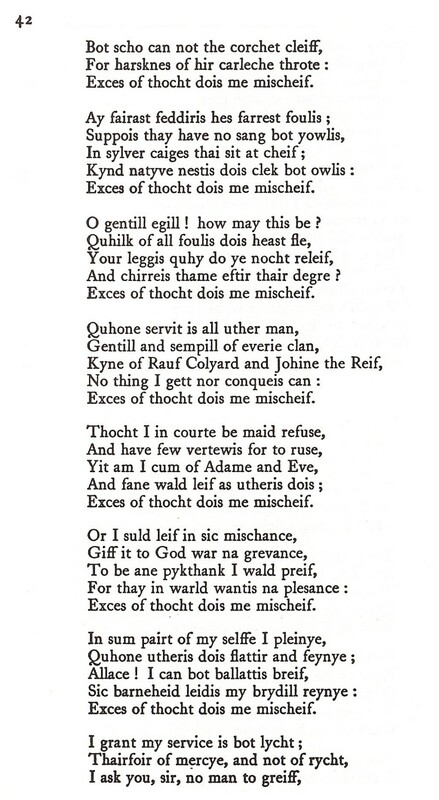 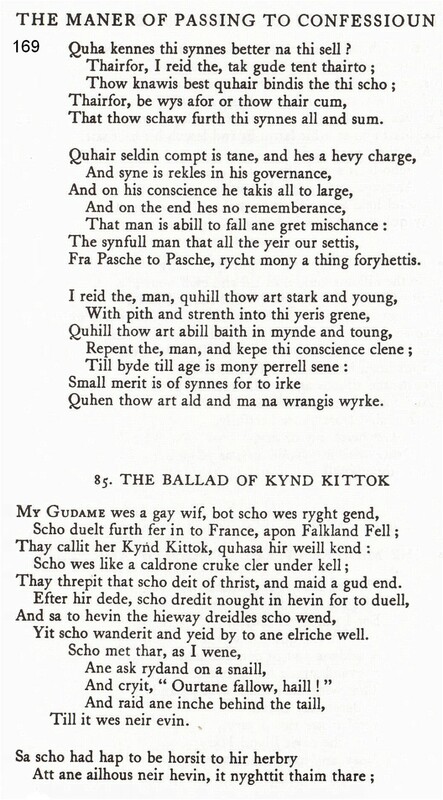 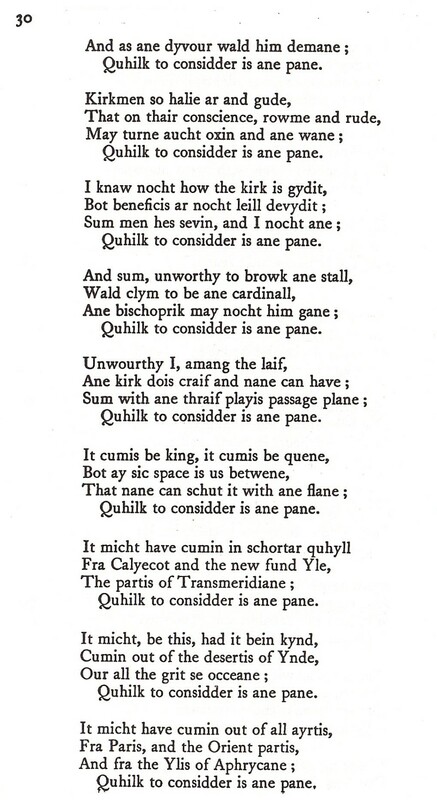 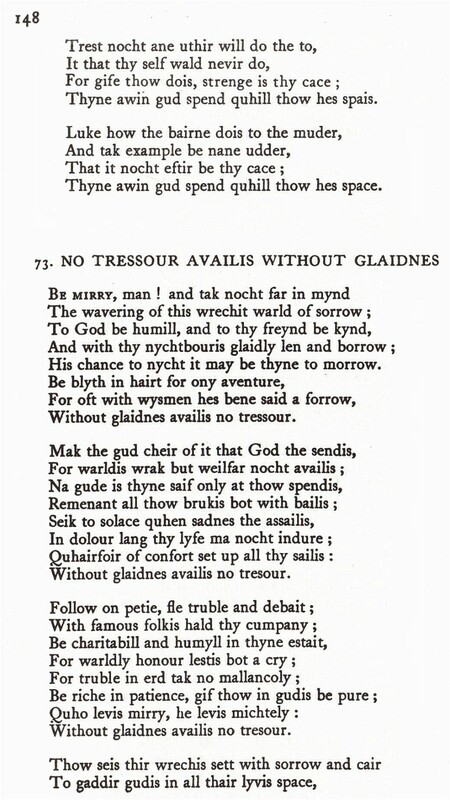 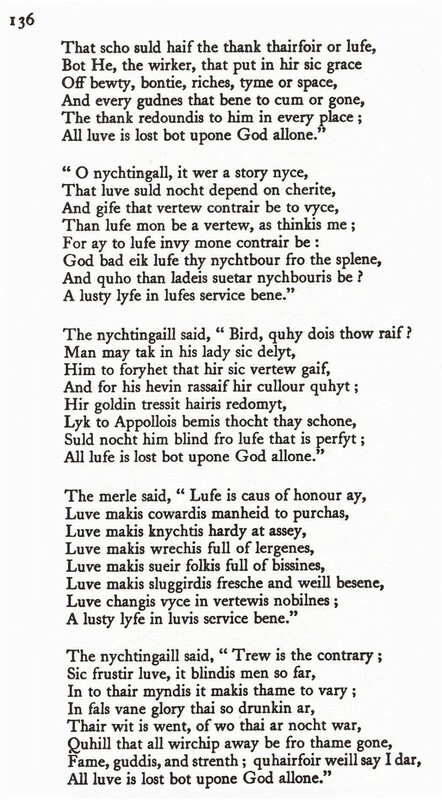 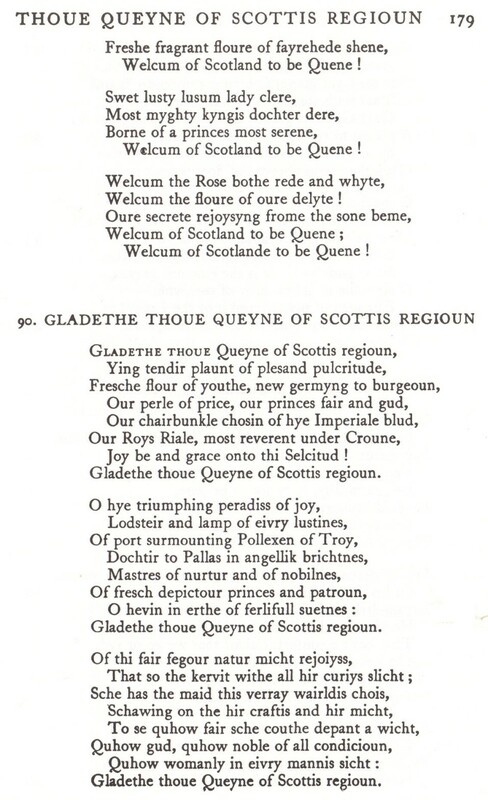 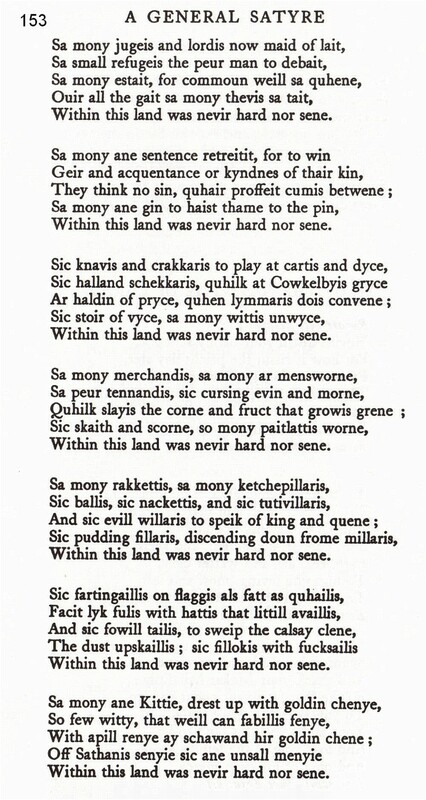 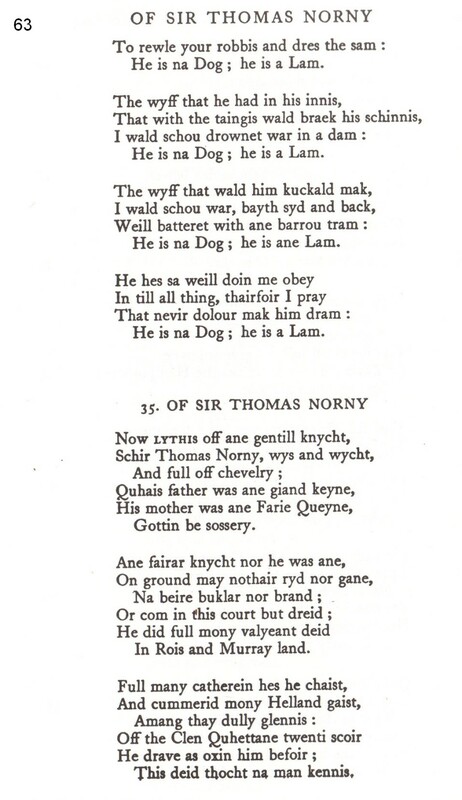 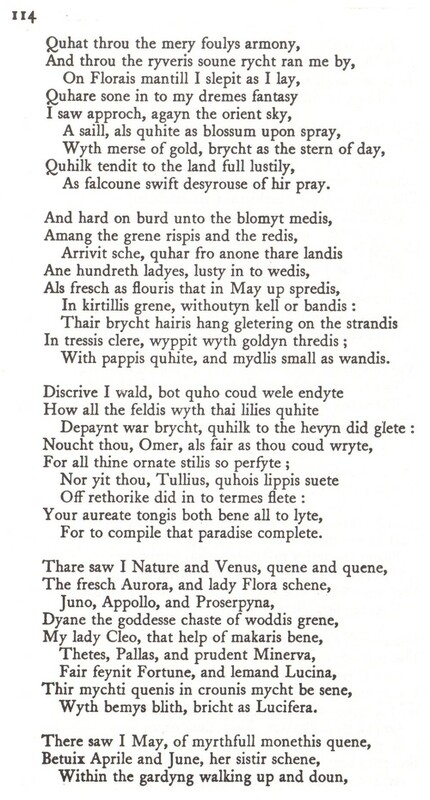 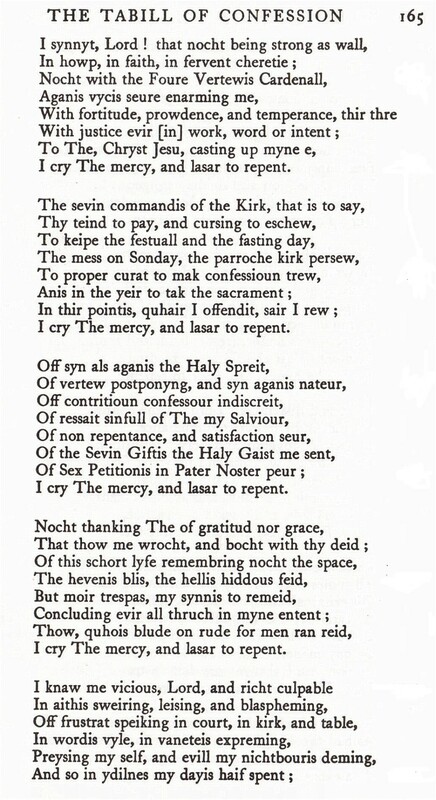 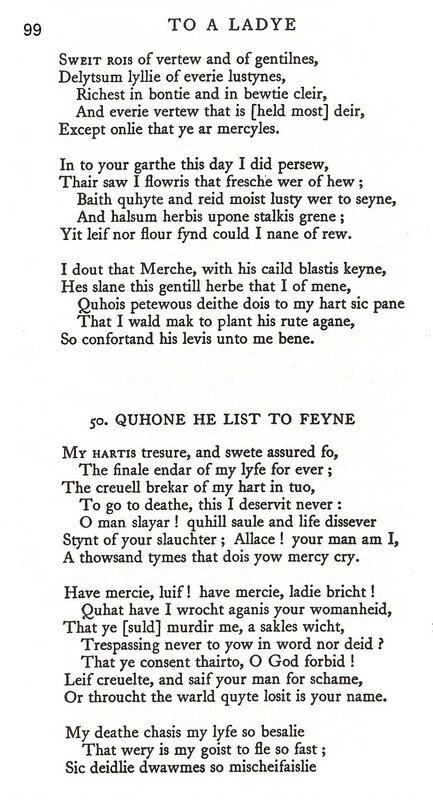 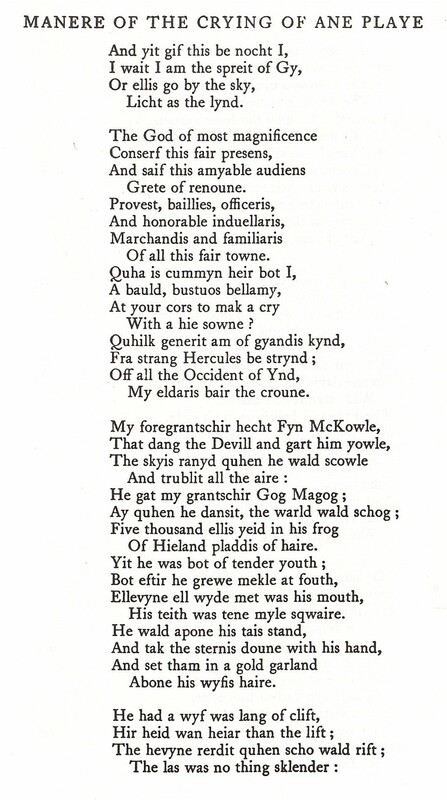 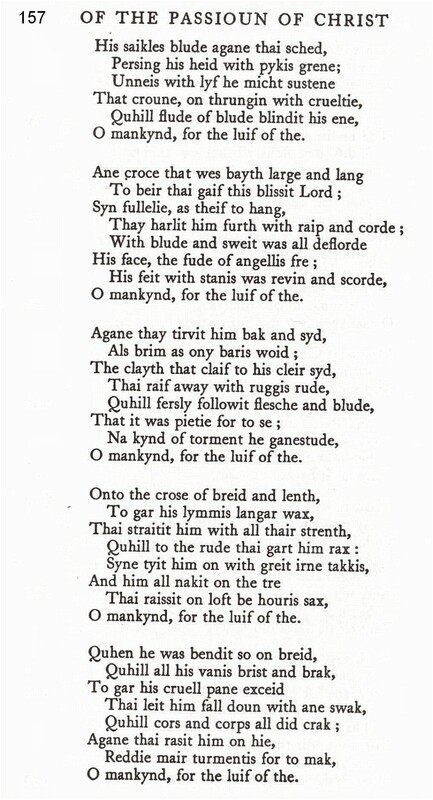 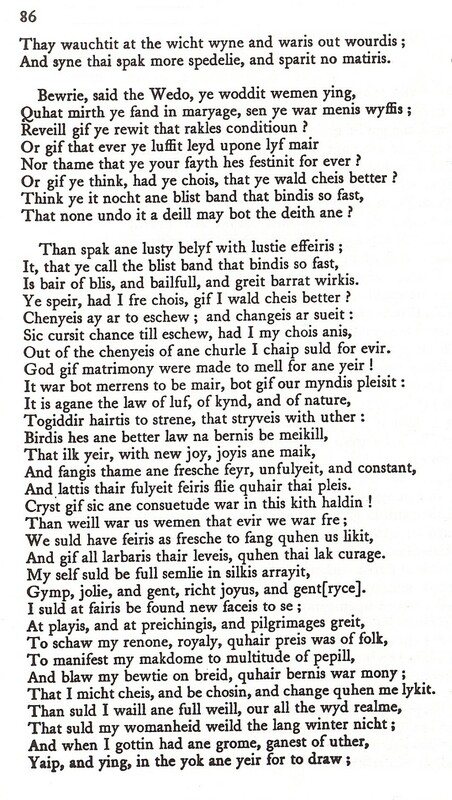 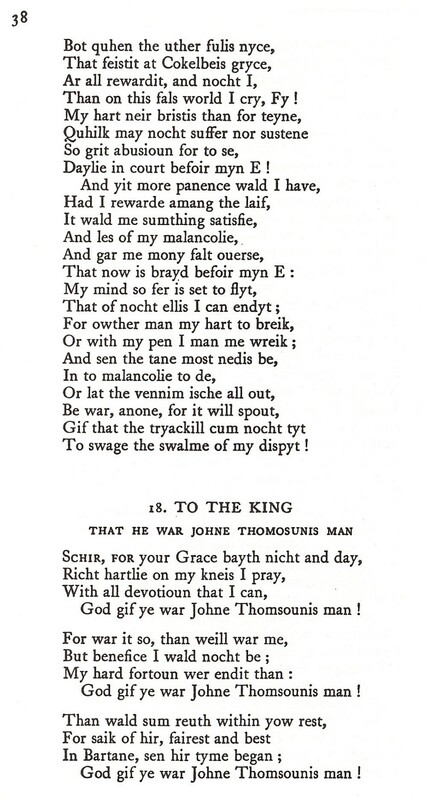 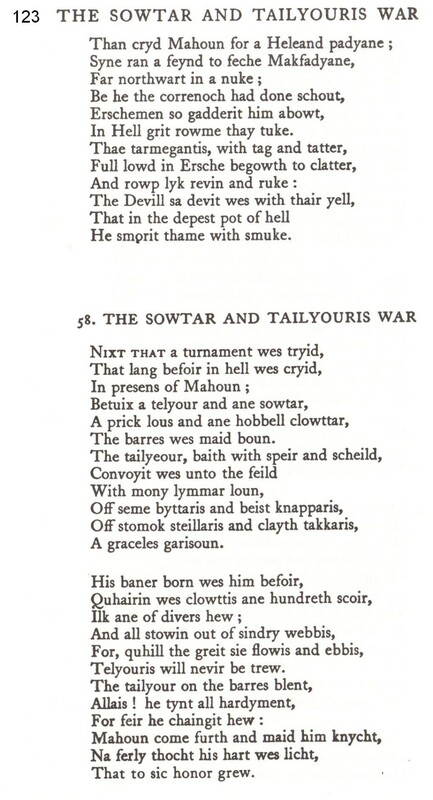 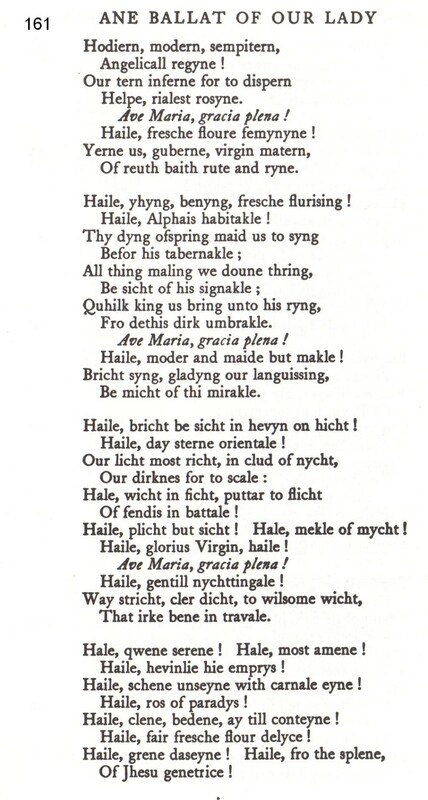 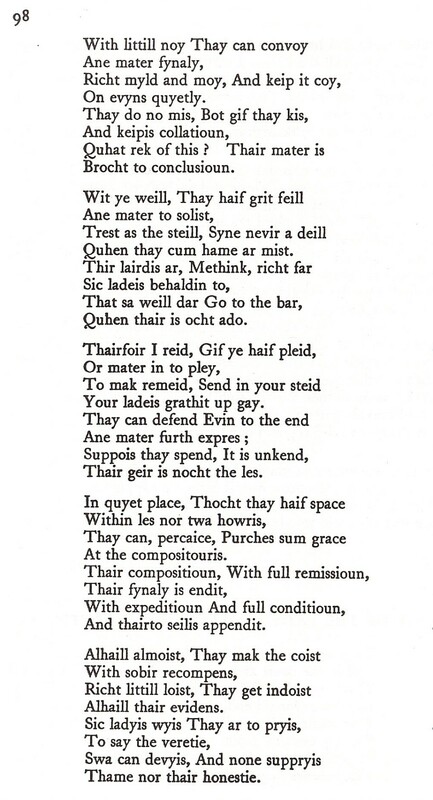 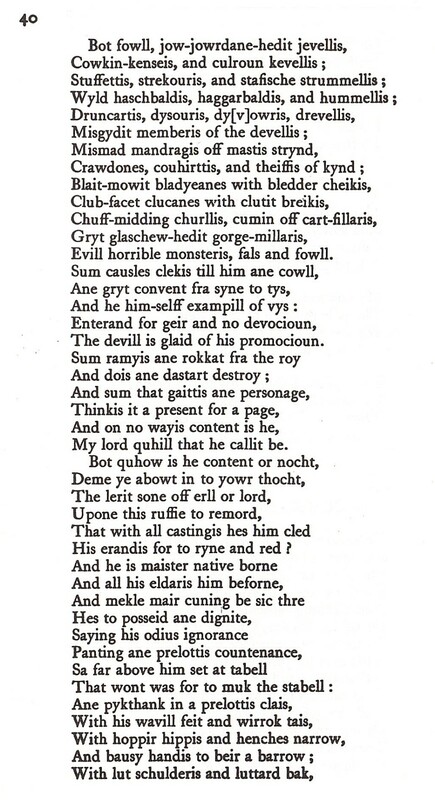 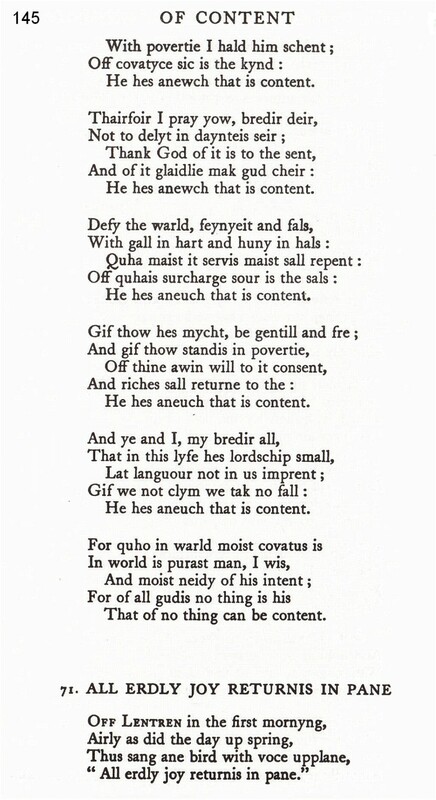 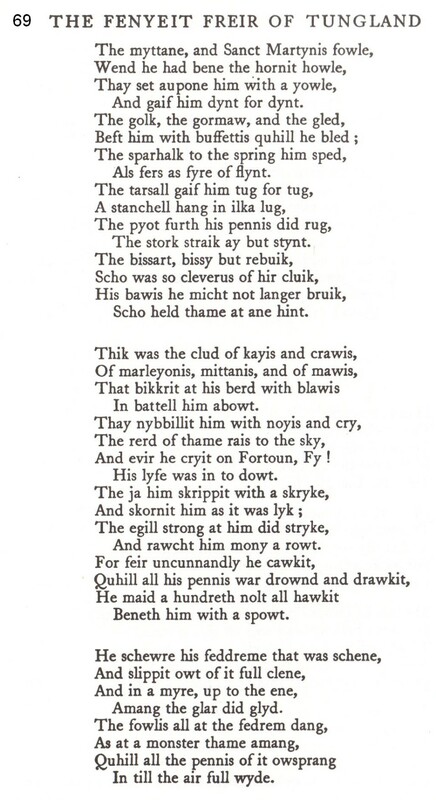 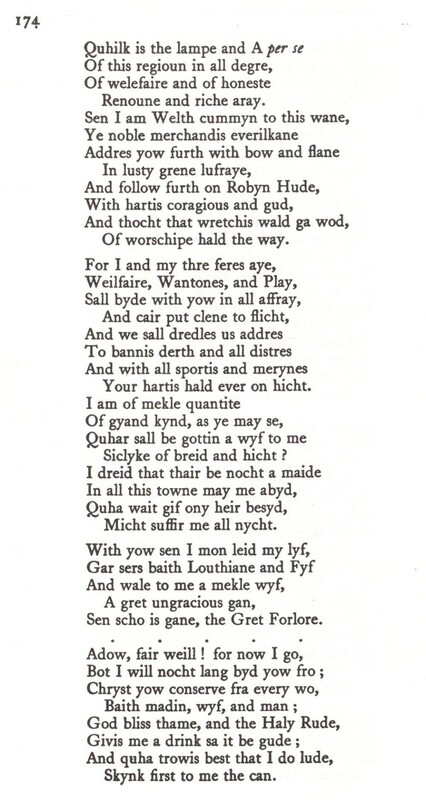 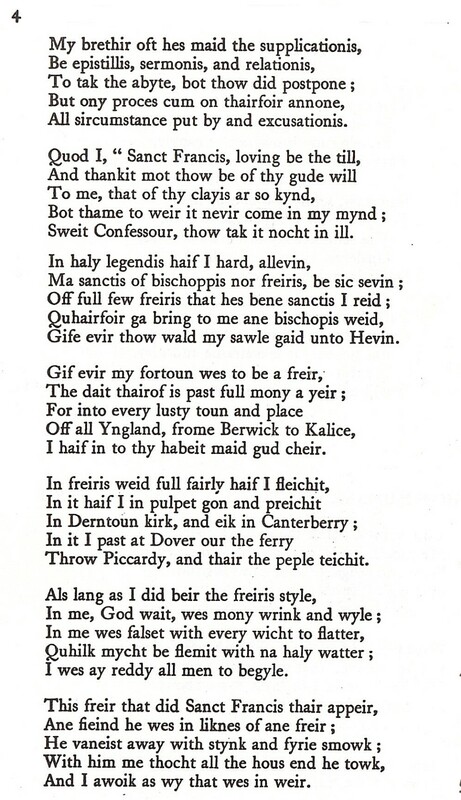 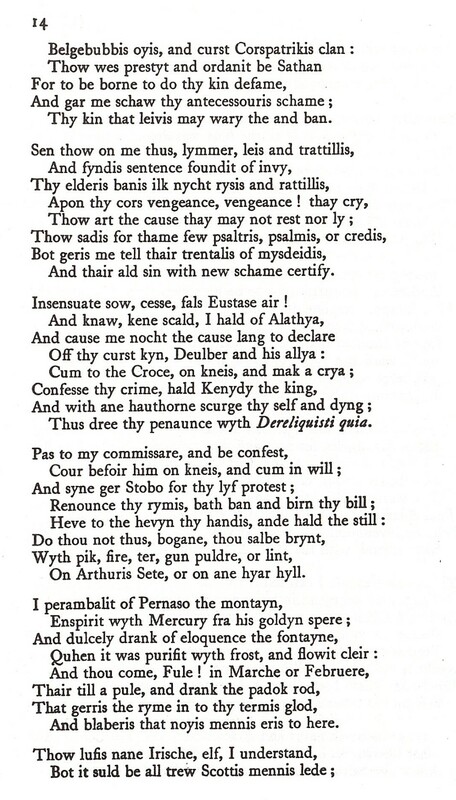 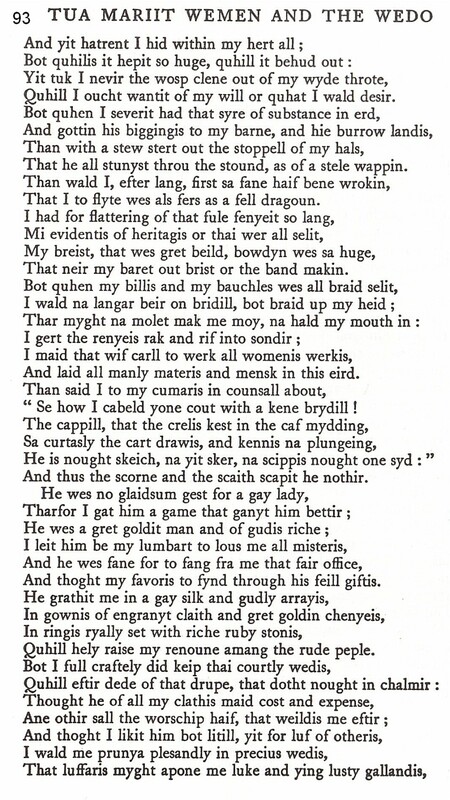 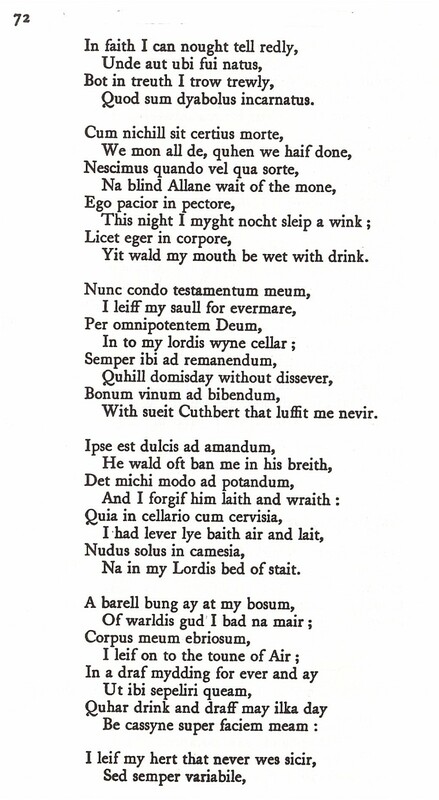 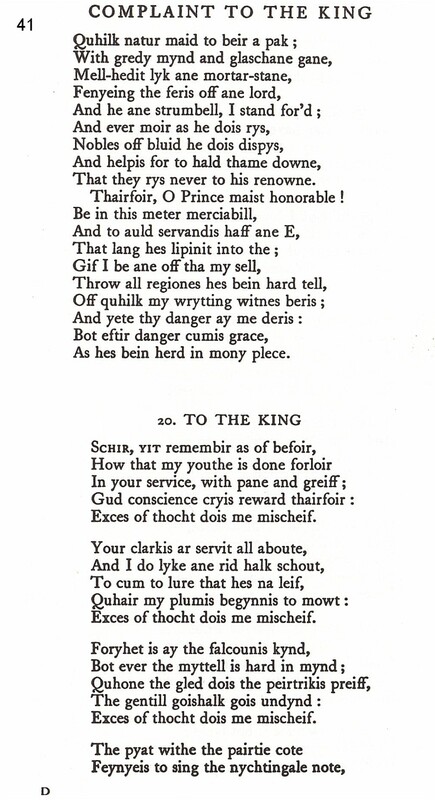 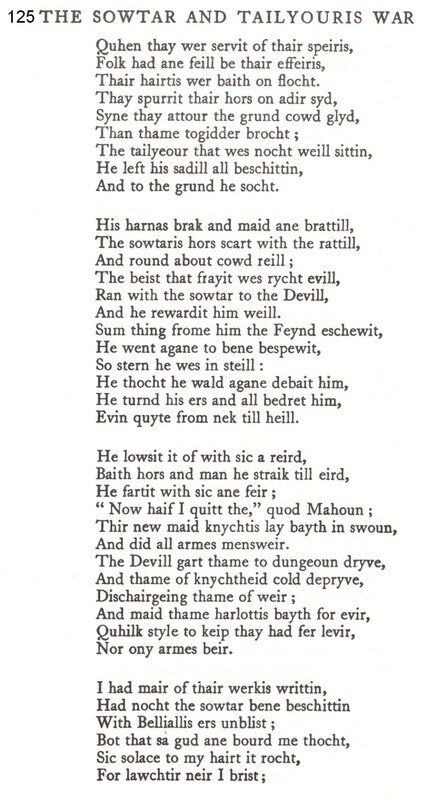 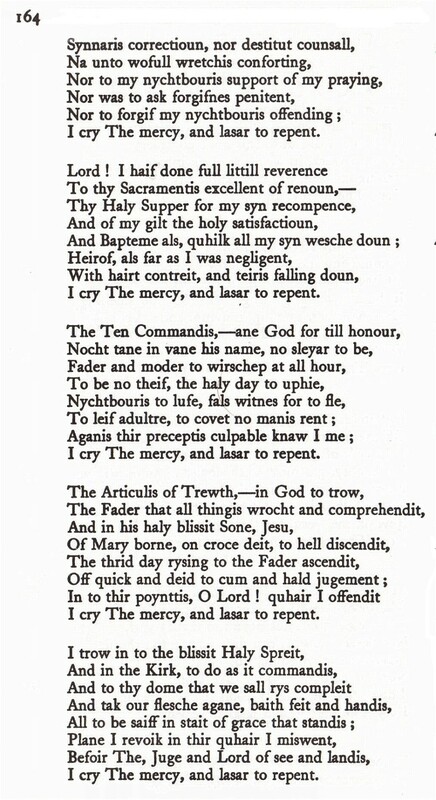 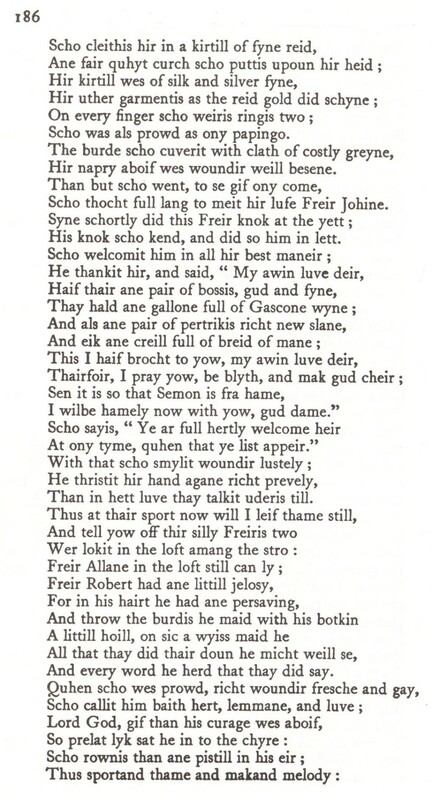 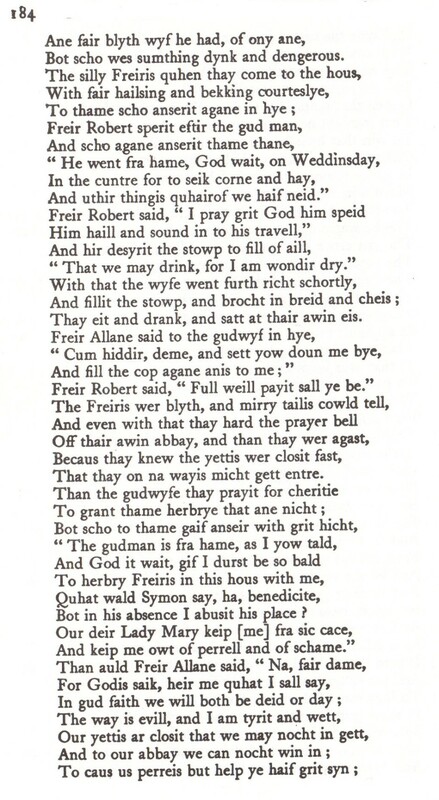 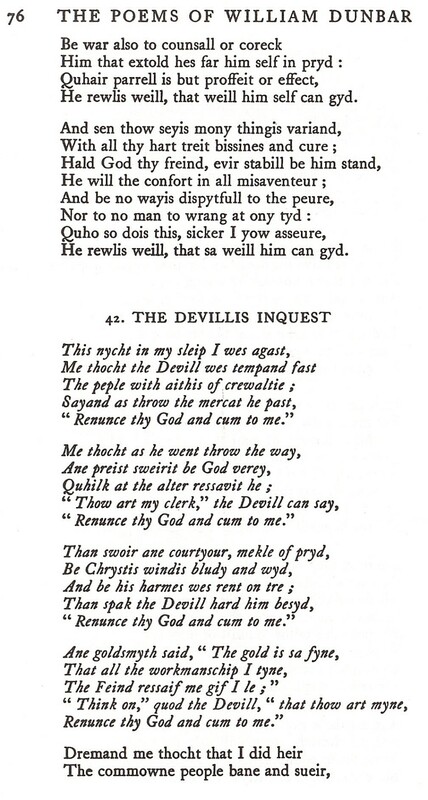 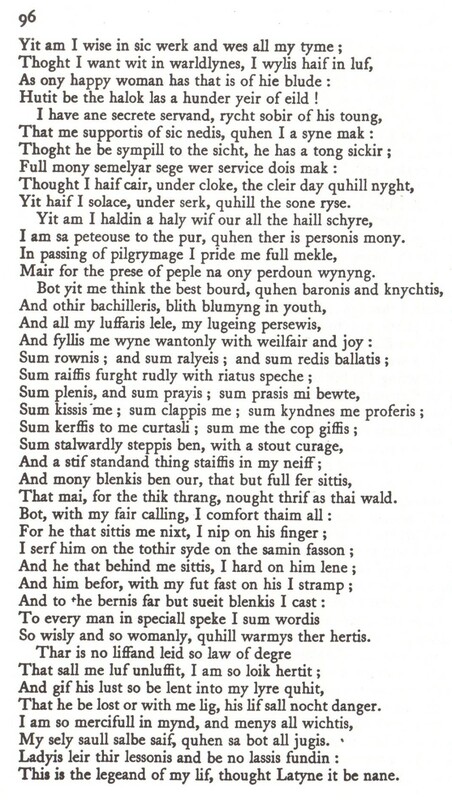 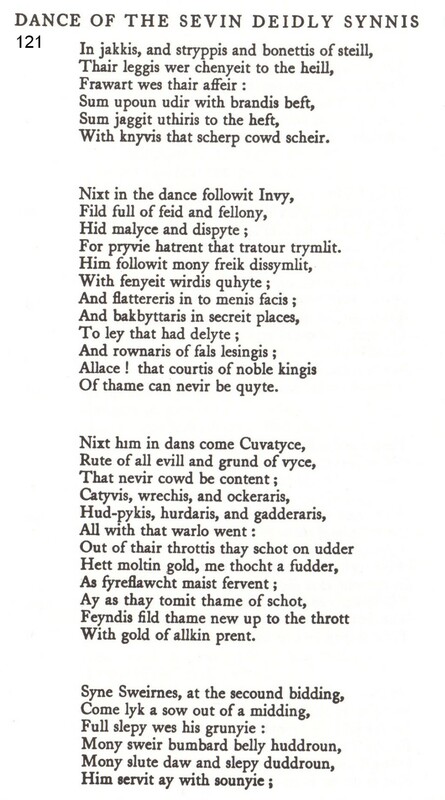 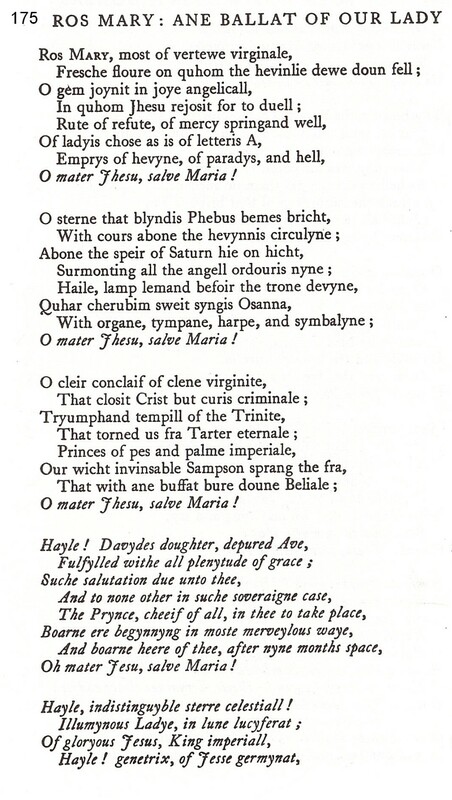 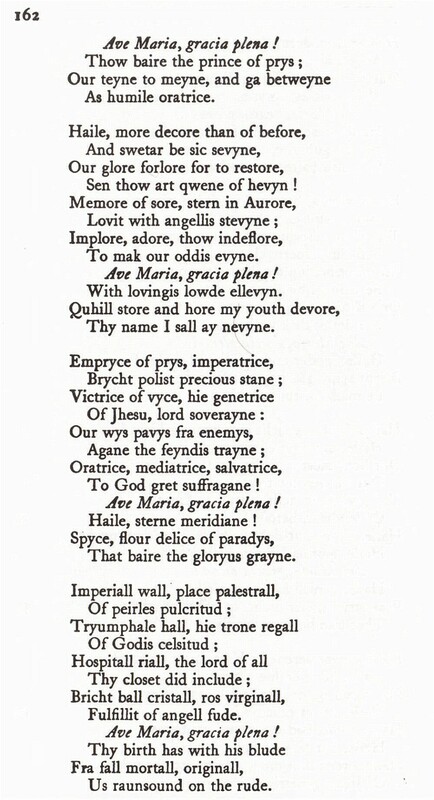 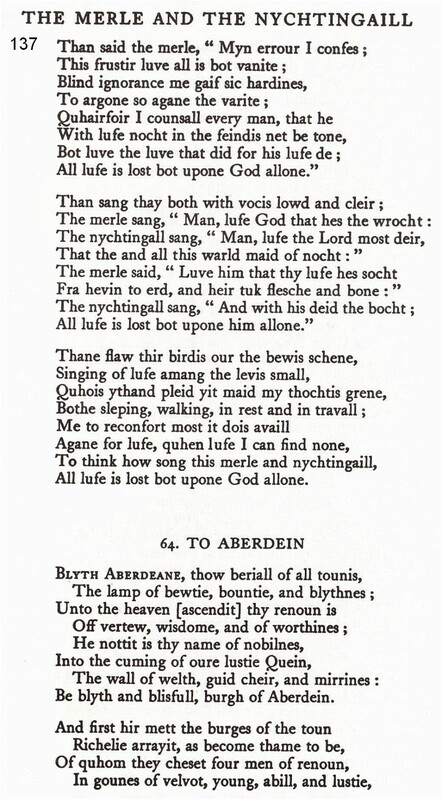 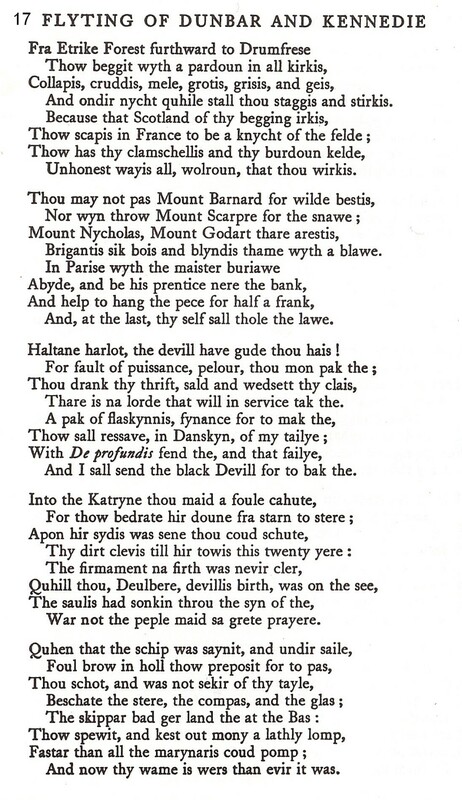 In 1508, 7 of his poems were printed for what was the earliest example of Scottish typography. 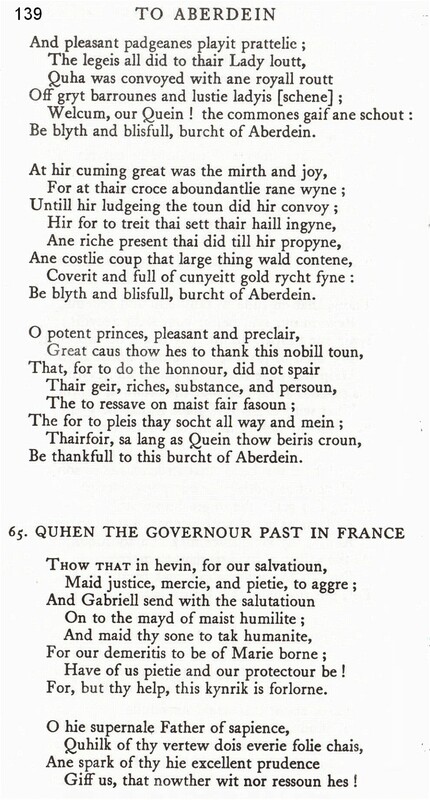 In the train of Queen Margaret he visited Aberdeen in 1511. 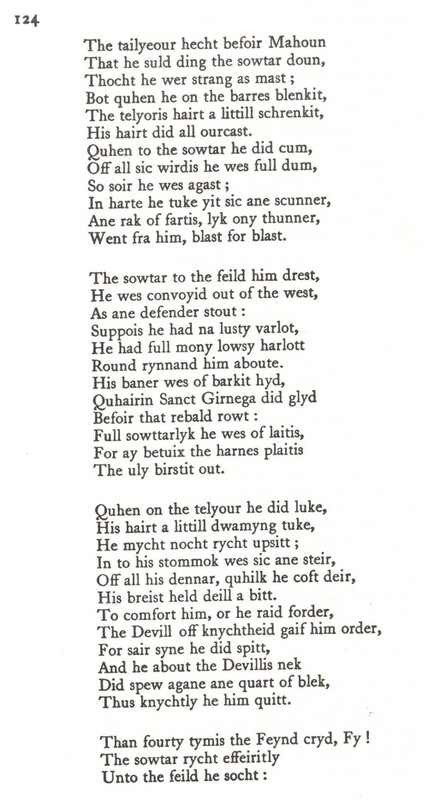 He disappeared within a few years – whether he fell at Flodden Field is a matter of conjecture. 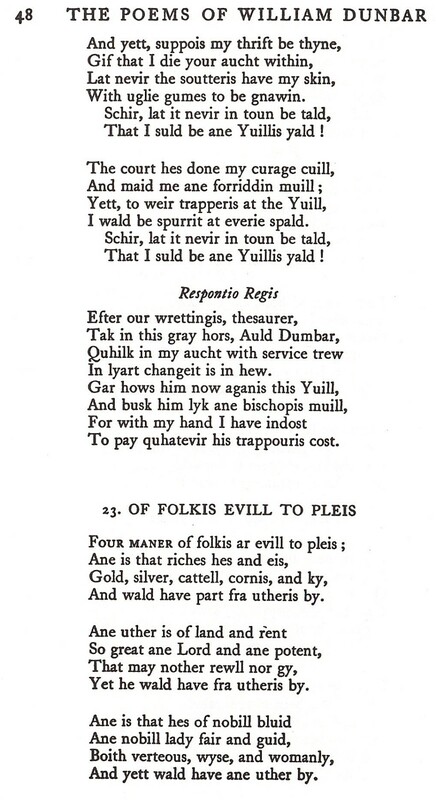 William Dunbar on occasion not only embraced the piety of Cowper but also could be as colourful and capricious as Spencer and Chauceresque in his coarseness coupled with an elegiac or satirical touch as and when the occasion presented itself.